rutalism. 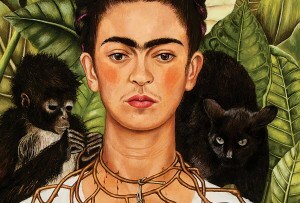 Beaux Arts. Victorian. Colonial Revival. Boston isn’t lacking in the interesting-looking building department. While there are loads of old structures—and tons of new ones springing up—not all of them are, you know, good. For that reason, and the fact that the city isn’t known for its dazzling architecture, we’ve compiled a list of the 100 best buildings here. The ranking, of course, is wholly subjective and highly opinionated. 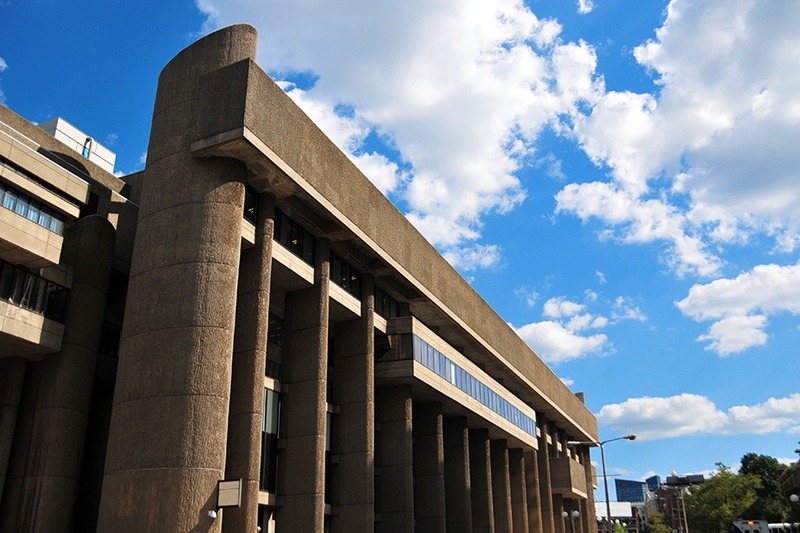 We love Brutalism, so what? And yes, there are quite a few old white male architects represented. This is Boston, after all. But we hope everyone will be able to spot a few of their personal favorites in here, from iconic designs, to well-known architects, to neighborhood landmarks, and more. We ranked the buildings—with a few choices in Cambridge, for good measure—with several factors in mind, such as architectural prestige, design, historical significance, and plain old coolness. Look over our list and tell us what you think. Arguing is encouraged. It’s only fitting that the oldest historical society in the United States would have a nearly 120-year-old home. 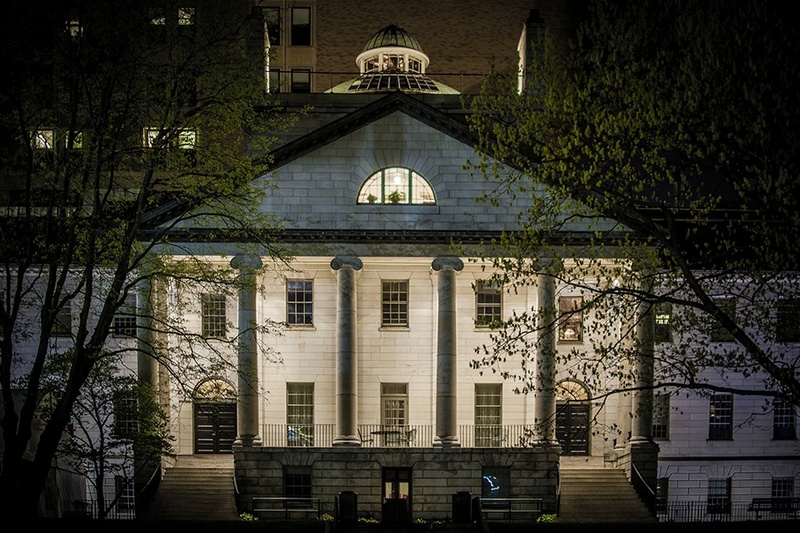 The Massachusetts Historical Society, founded in 1791, had its headquarters modeled in the Colonial Revival style. 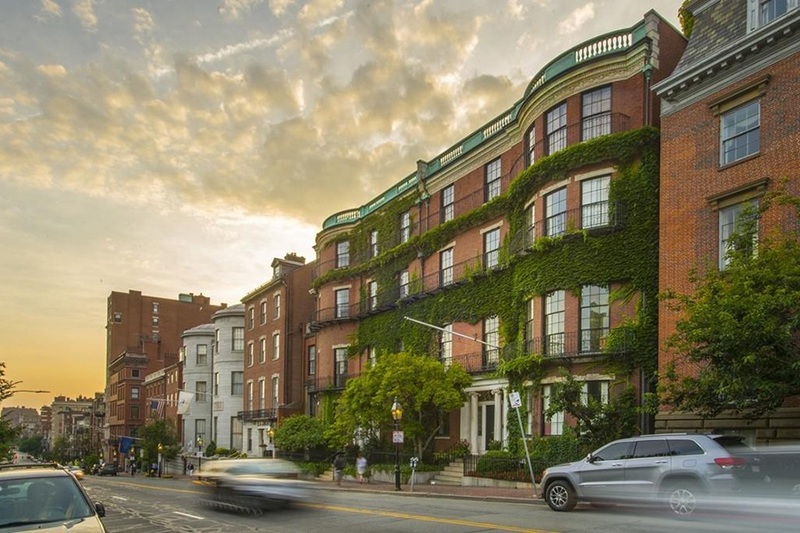 The bow front exterior, Doric columns, and washed-out color of its yellow Roman brick gives this historical structure in the Fenway stately curb appeal. 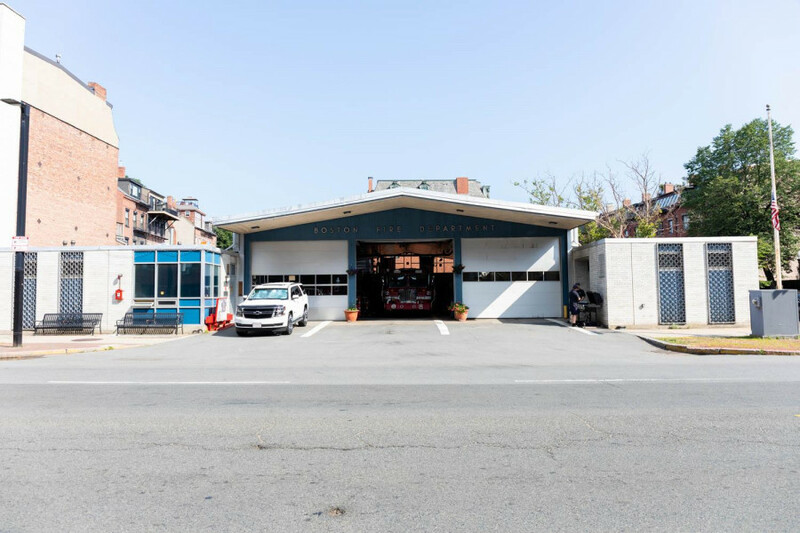 The low-slung, overhanging roof and midcentury modern style of this fire station makes it a conspicuous feature on Tremont Street, near the South End branch of the Boston Public Library. Two plaques installed on the outside of the station commemorate the lives of five soldiers who died in the line of duty during the 1972 Vendome Hotel Fire. Tall and neat, the Beaux Arts-style R. H. Stearns building hints at a bustling interior full of office dwellers poring over spreadsheets. In fact, it used to be a department store and offices, though these days it serves the purpose of housing for the elderly. MIT’s Simmons Hall is a Cubist’s dream. The huge geometric masterpiece comes to life at night with the steady blinking of some 5,500 windows, almost like a huge computer modem. The architect’s idea was to create more of a living, breathing structure, however. He wanted a porous design to allow for light filtration all throughout the mammoth structure. Architect: Stone & Webster Engineering Co. 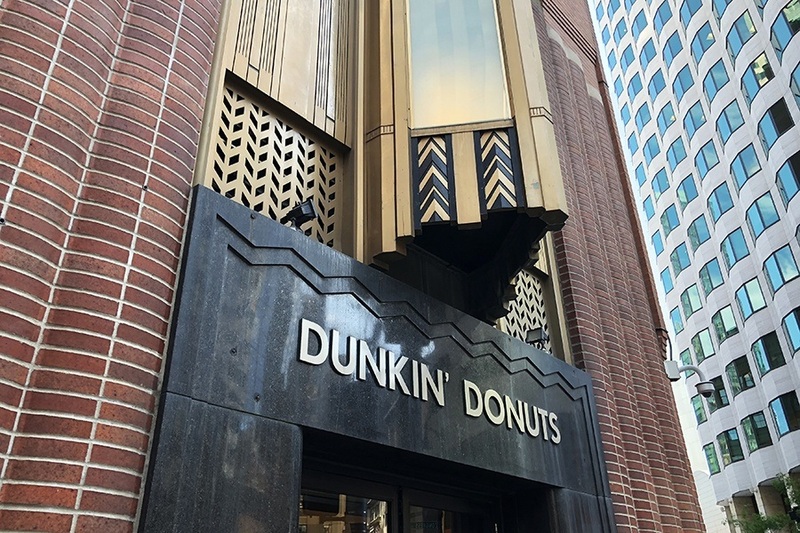 Built as a Western Union outpost in 1930, this Art Deco structure is now home to a très fancy Dunkin’ Donuts with polished marble and geometric ornamentation. (This Dunkin’s is so good, it’s worthy of a love letter.) Its exterior takes design cues from Egyptian and Mayan art, Cubism, Fauvism, and Expressionism. Just look at that chevron motif. 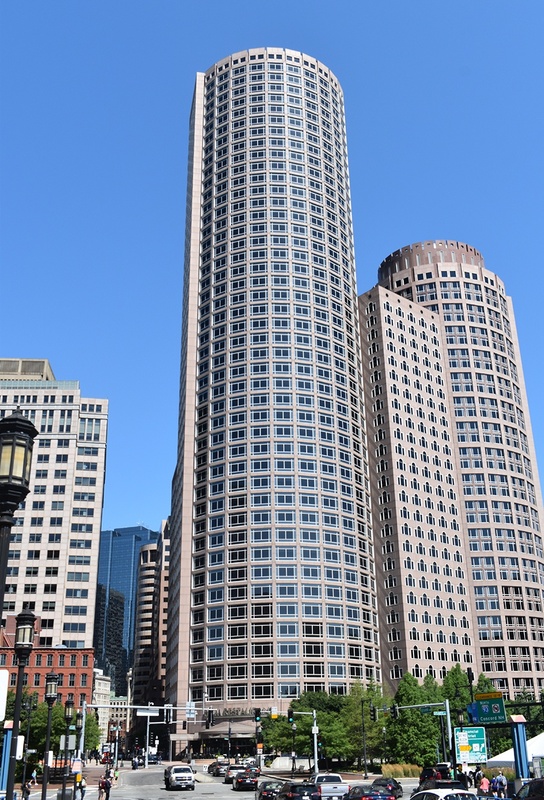 Famous from being etched onto hundreds of mugs, t-shirts, and art prints of the Boston skyline, One International Place (all 46 floors of it) towers over the Financial District. Its rounded modern facade means more windowed offices inside and an impressive neck-stretching height on the outside. 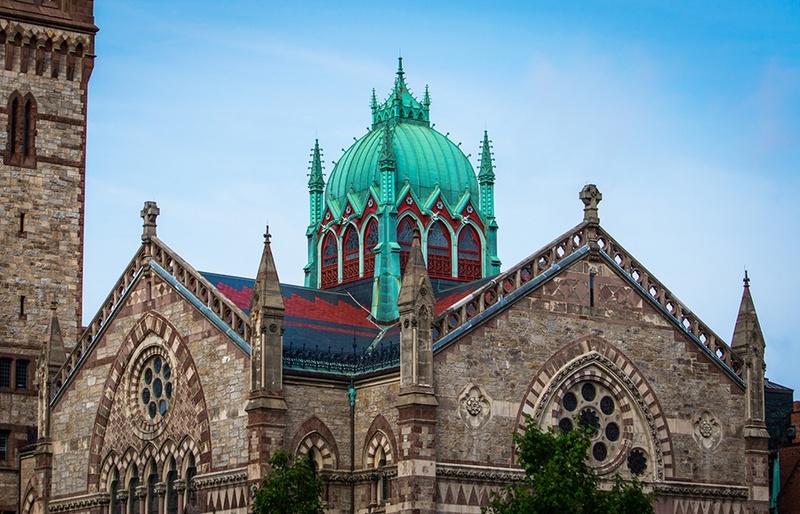 Although its backside resembles a classical building topped with a dome, the Boston Architectural College really lives inside a concrete-and-glass structure. The domed appearance actually comes from a deceptively detailed mural that was added almost 10 years after construction. 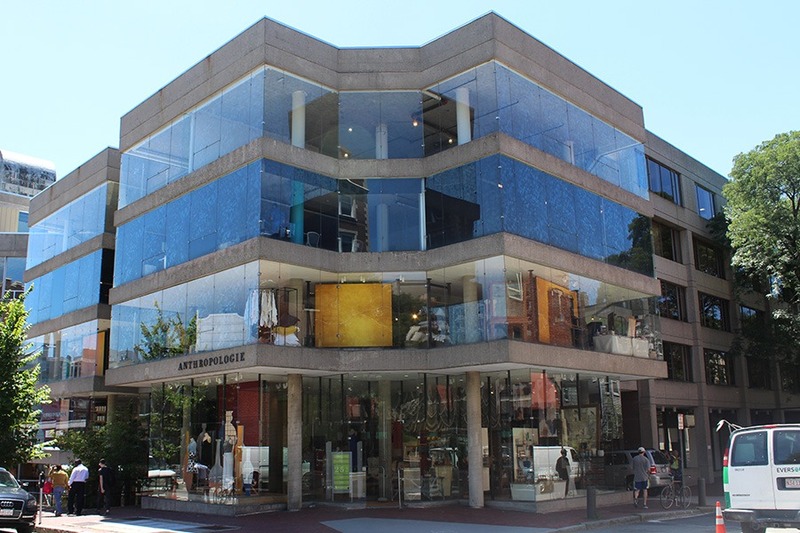 Its Newbury Street side, however, is rectangular, large-windowed, and a welcome Brutalist break in Back Bay. 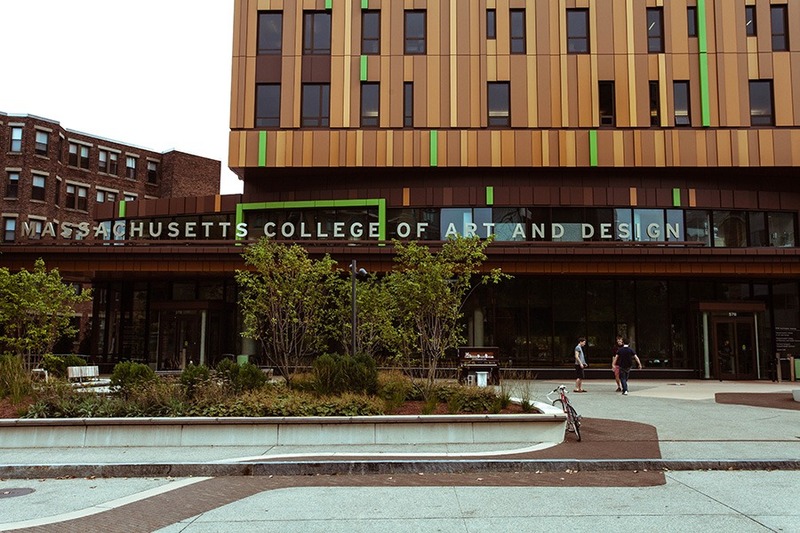 For a primarily commuter college, building a residential hall marked a period of major growth at Massachusetts College of Art and Design. Its Treehouse residence hall appropriately fuses growth and art into one structure. Inspired by Gustav Klimt’s Tree of Life, the building’s exterior boasts a comparable mosaic design out of staggered aluminum panels. A dark-colored base gradually lightens toward the top into the same shade of tan Klimt used on the bark of his tree. “I find the design so optimistic, colorful, and refreshing,” says the design team’s leader, Tamara Roy. 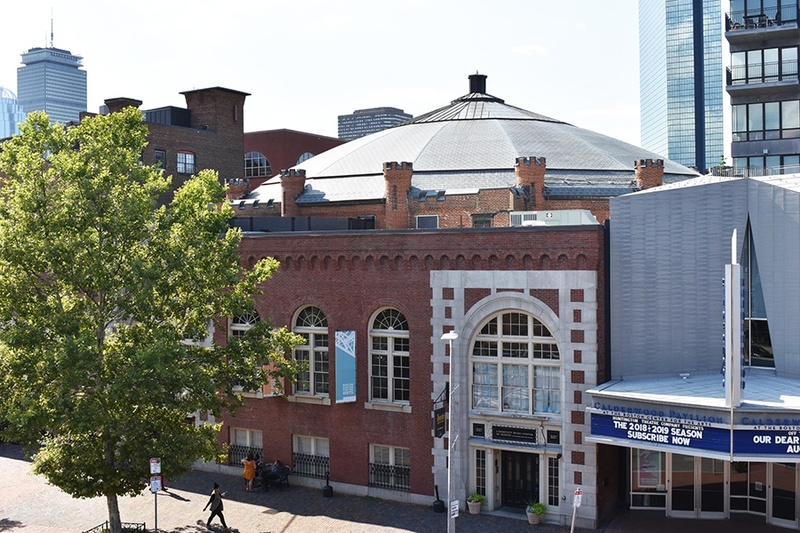 The South End’s rounded Cyclorama was built to house a 400-foot circular painting of The Battle of Gettysburg, but the Classical Revival-Victorian exterior shouldn’t be overlooked. Its pleasingly symmetrical dome is bordered by high turrets and sports classically beautiful brick work. It’s the only Marcel Breuer-designed building in city limits, and it’s severely underappreciated. Madison Park High School is a series of concrete-faced structures that, like City Hall, resemble honeycombs. 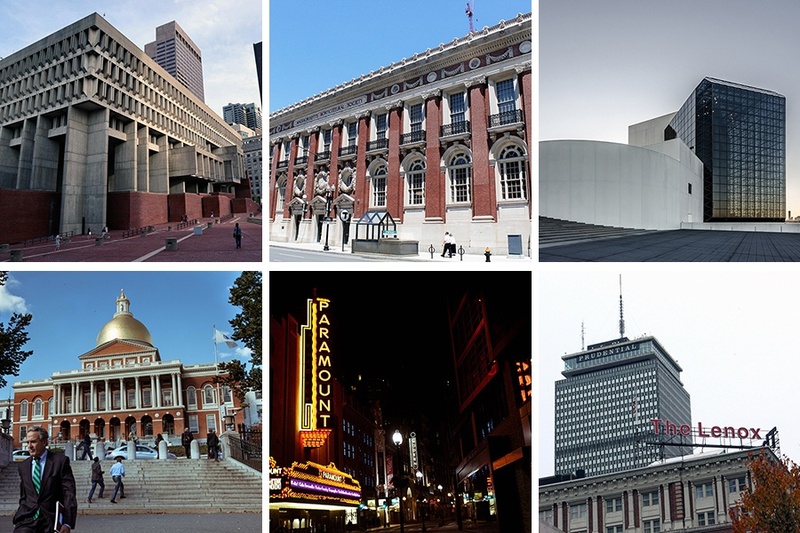 “The interconnected buildings house some of the most outstanding facilities of any high school in the country,” write Susan and Michael Southworth in their 1984 AIA Guide to Boston. The gymnasium alone contains three pools and a rowing tank. If the founding fathers returned to Boston today, they wouldn’t recognize most of it. 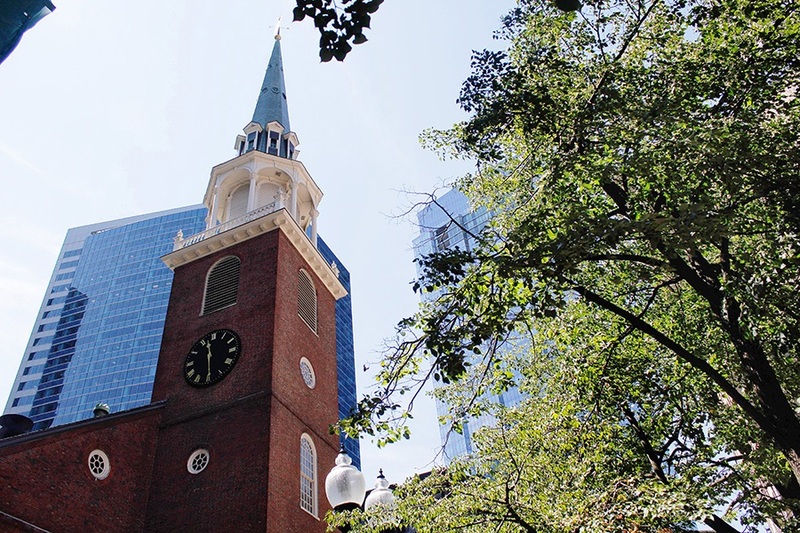 But they could still probably find their bearings based on the Old South Meeting House’s iconic white steeple. 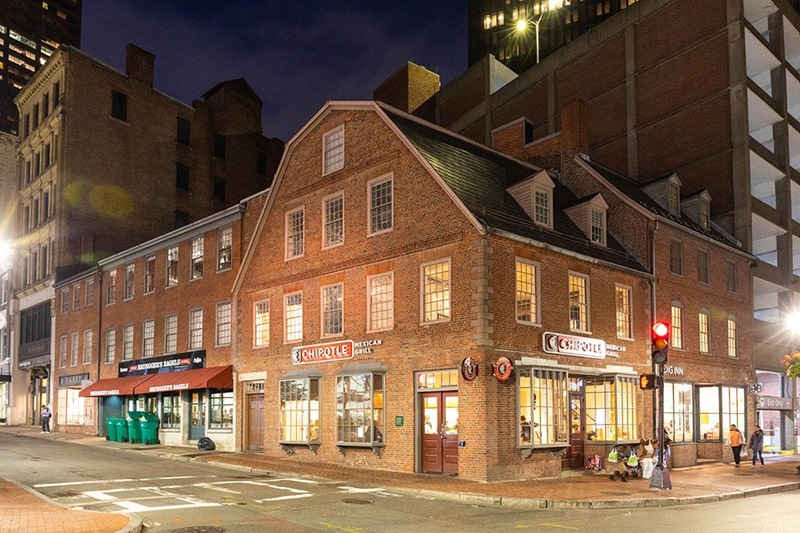 Famously the site where the Boston Tea Party was organized, it now sits among the shiny new office buildings and 7-Elevens of Downtown Crossing, but the red brick and green oxidized copper ensure it holds its own. 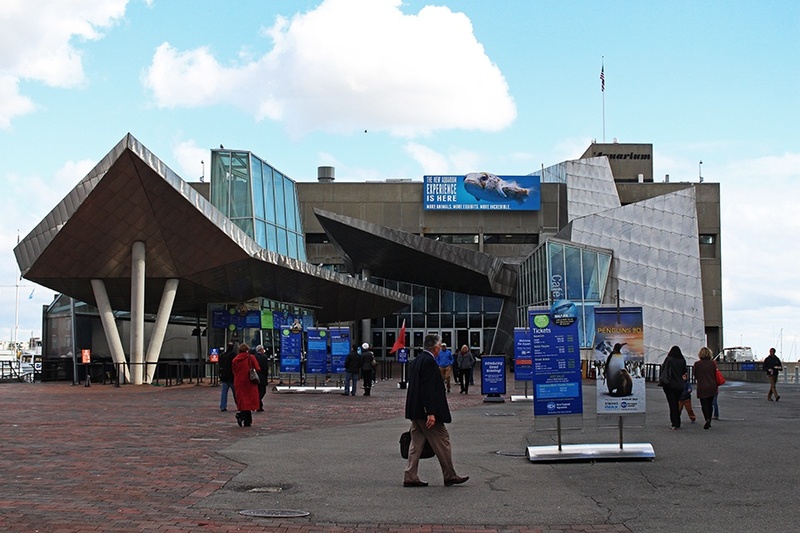 The New England Aquarium is wonderfully Brutalist both inside and out, which makes sense, since the building was designed from the inside out. Dreamed up by aquarium specialist Peter Chermayeff, a founding partner of Cambridge Seven Associates, the concrete structure was built around a one-way visitor path that makes its way through a dark atrium space. According to Peter Chermayeff LLC, the visitor experience switches between large and small, dark and light, and wet and dry, and is anchored by a central cylindrical tank. Back when Quincy Market used to border the Boston waterfront, the Mercantile Wharf building served as a storage warehouse, which explains its rough Boston granite exterior and imposing length and width. A cornice trims the length of the building on top, while the bottom level traces a series of arched entrances in groups of three. After a fire ripped up the interior of the building in the ‘70s, the bottom level was converted into neighborhood businesses, the upper floors into apartment units. 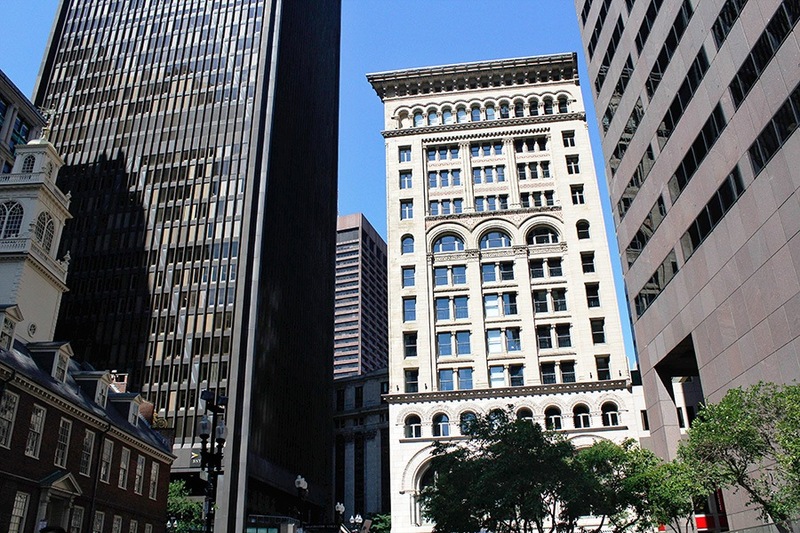 One of Boston’s earliest skyscrapers doesn’t seem so tall anymore, but its Romanesque style has stood the test of time. The closer you look, the more ornate details you can spot, from the carved doorways to the extremely detailed overhang all the way at the tippity top. This posh hotel used to be the Charles Street Jail until 1990 when it was closed due to overcrowding. The beautiful building is all swank and luxury now, though the hard symmetry of the exterior still manages to remind us of something more custodial than ostentatious. The stout and regal Proctor Building wears its oxidized copper cornice like a crown. It is an art piece from the 1890s that has remained an uncommon ode to the Spanish Renaissance style as newer, taller buildings crop up around it. The Abiel Smith School, located in a brick schoolhouse in Beacon Hill, was the first publicly funded school for African American children in the U.S. 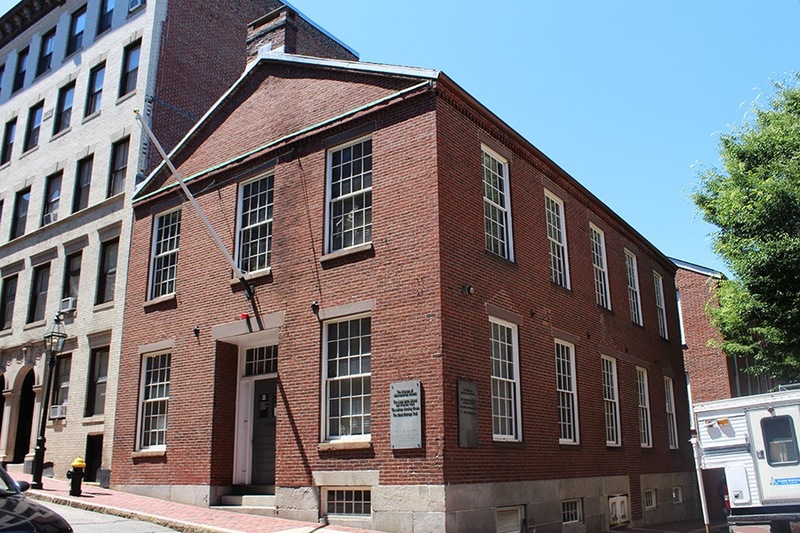 The traditional structure became the site of Boston’s fight for educational equality, and it wasn’t until 1855 that the American flag hanging from the protruding pole on the school’s facade stood for the kids inside, too. This quaint Georgian mansion near Harvard Square was utilized by George Washington as a headquarters during the Siege of Boston, and later, poet Henry Wadsworth Longfellow called the mansion home for most of his life. The pastel-colored abode is simply constructed with two-story columns and a center pediment, creating a gorgeous contrast with the lush lawns that surround it. The Batterymarch Building went up in 1928, and though it no longer towers over its neighbors, this rosy skyscraper is still a striking example of Art Deco flair. For Boston’s first wholly steel-framed structure, the Winthrop is surprisingly vintage in appearance. 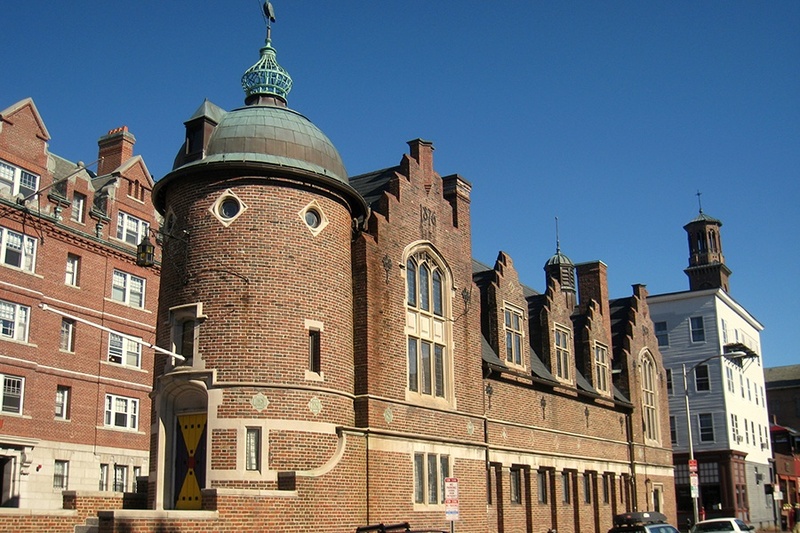 Its egg-and-tongue molding, Renaissance Revival style, and dark green and red brick facade stand out next to the cool gray granite of its neighbors. 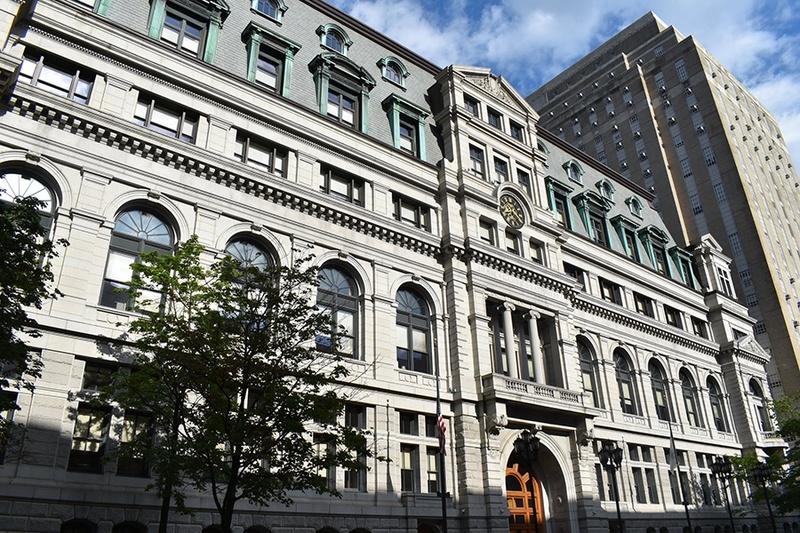 The Winthrop was originally dubbed the Carter Building, but was later renamed after Governor John Winthrop because he once owned a home right next to it. 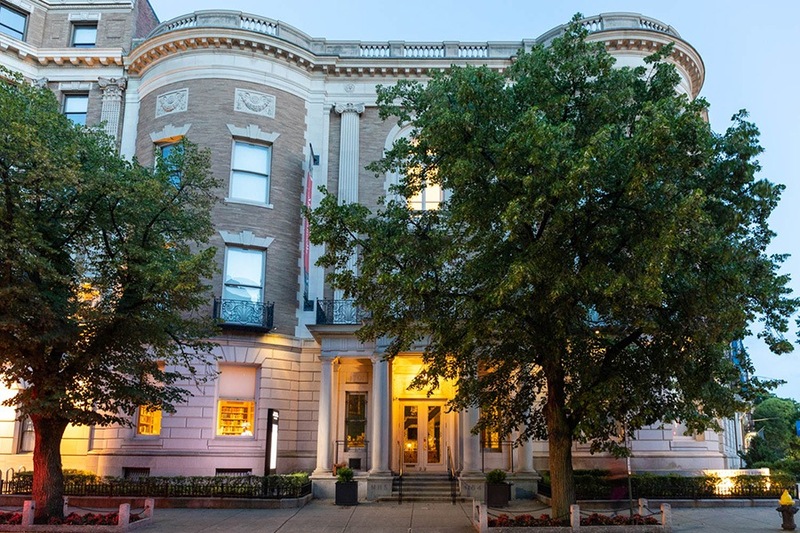 Created in the fortress style of Florence’s Palazzo Vecchio (and appearing strikingly similar to Provincetown’s Pilgrim Monument), the Pine Street Inn originated as a headquarters for the Boston Fire Department. 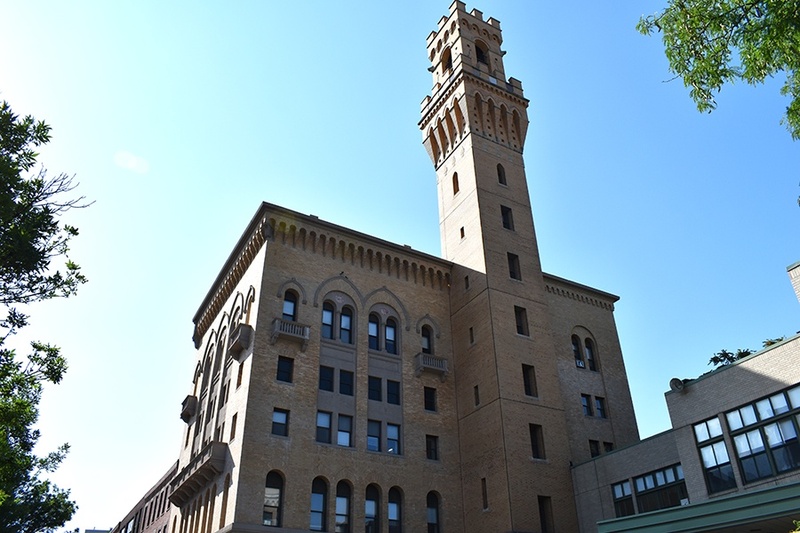 The firefighters’ need for a lookout tower explains how the architects managed to skirt the former 125-foot height limit for Boston buildings. The tower itself, which dominates the structure, is made up of yellow brick, evoking the image of a medieval battlement. By 1969, the building had changed its use dramatically. Now, it is owned and operated by the Pine Street Inn, a homeless shelter and social services center. 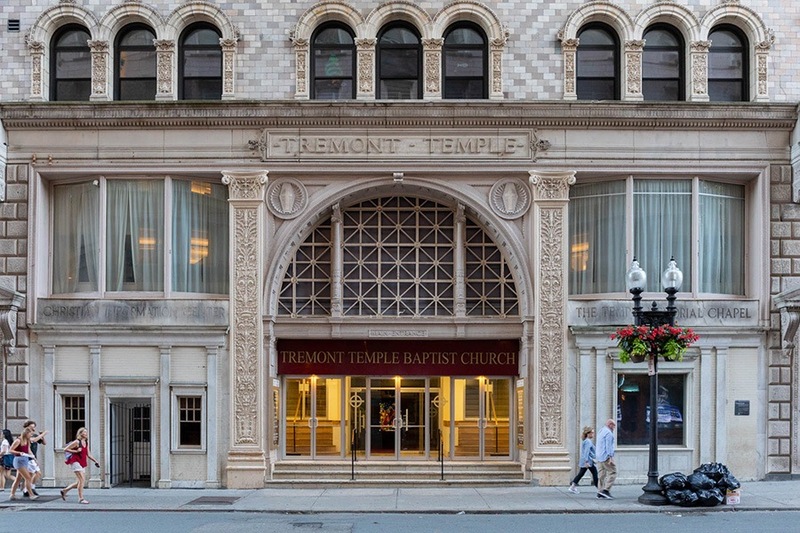 Standing curbside and peering upward at the flat face of the Tremont temple has a dizzying effect, a result of its enormity and the Venetian-style diamond-patterned stonework. 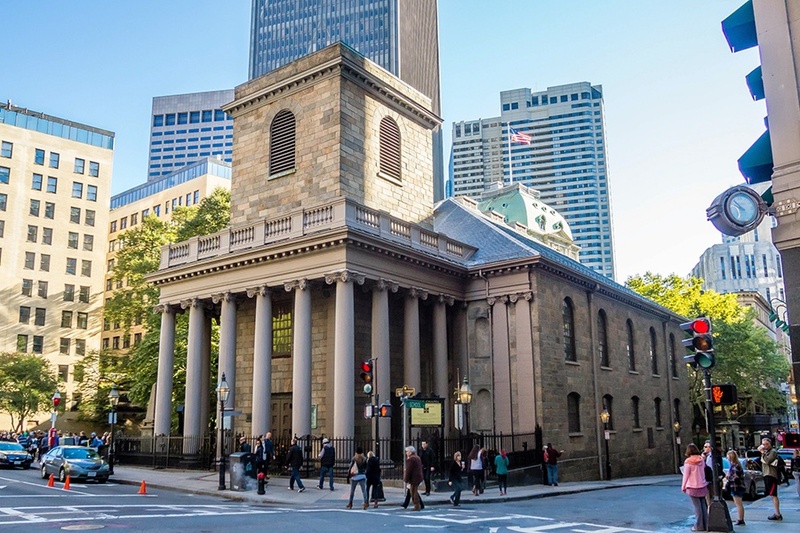 In the late 1800s, the Free Church Baptists of Boston needed an improved space for their free and accessible congregations—and prolific architect Clarence Blackall delivered. The temple’s magnificence has been widely recognized in its history—the likes of Daniel Webster and Jenny Lind have visited for speeches and performances. Before Macy’s took over the department store empire, there was a different chain in town. Filene’s, named after its founder William Filene, opened in 1881, and quickly dominated retail across New England and New York in the 1900s. Renowned Midwestern architect Daniel Burnham was tasked with building a flagship store worthy of the rapidly growing Filene’s brand. 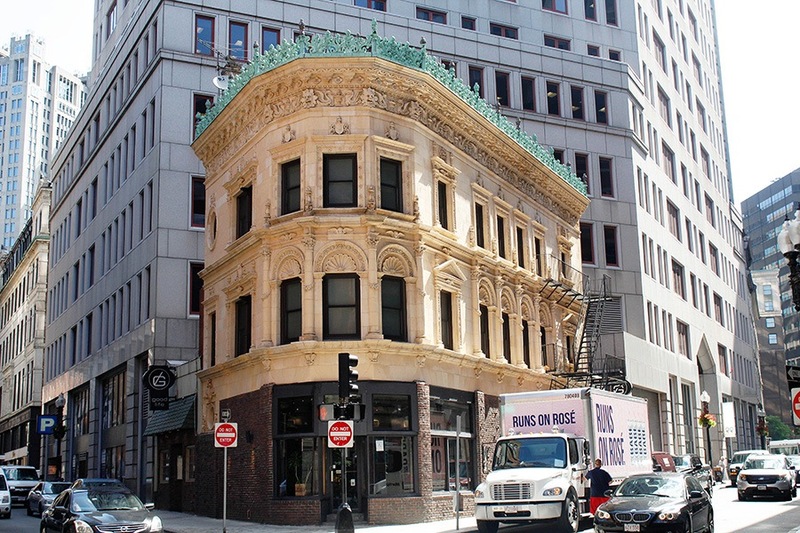 He modeled the store in the Beaux Arts style with gray and green terracotta finishes on the facade, the last aspect of the original building that still stands under the protection of the Boston Landmarks Commission. Today, the inside of what is now widely referred to as the “Burnham Building” hosts office spaces as well as modern department store chains. As it was built on the tail end of the Roaring 20s, this skyscraper reflects the Art Deco tastes of the period. 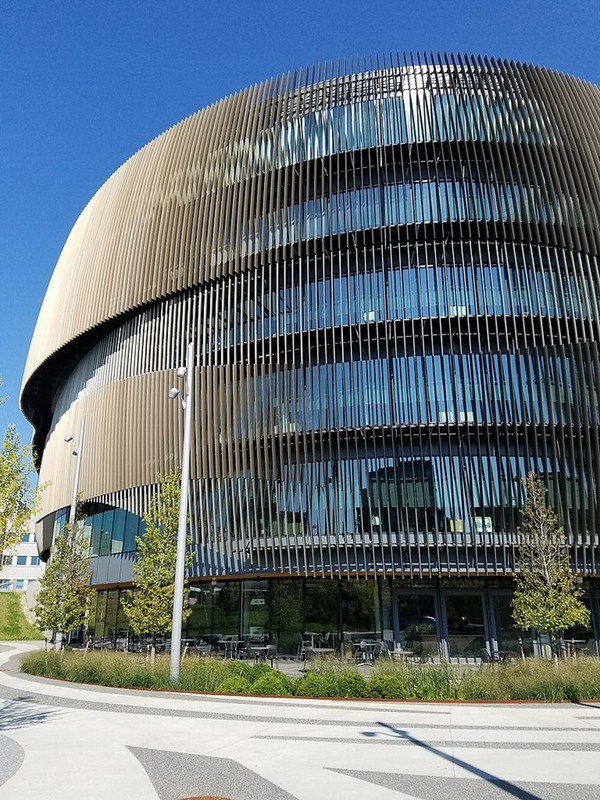 It’s adorned with bronze panels depicting the fields of finance, architecture and sculpture, agriculture, power, and transportation. Other panels show a carpenter, a stonemason, and a blacksmith. Before the building was constructed, the house of the first Roman Catholic Bishop of Boston, Jean Lefebvre Decheverus, stood at the spot. 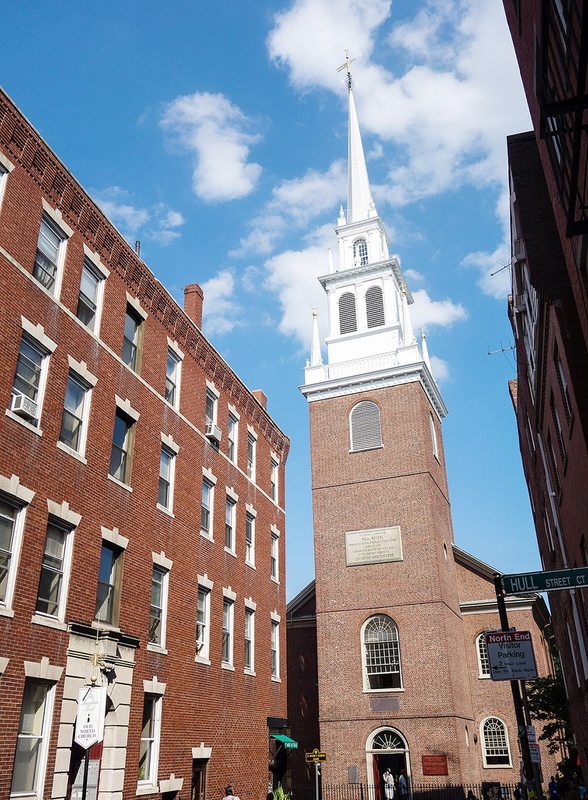 One if by land, two and a half feet of bricks make up the walls of the Old North Church, where legend says Paul Revere held up two lanterns before rushing out on his midnight ride to meet the British, coming in from the sea. The church’s tall white steeple sticks out among the brick-laden North End, though its Georgian architecture is right at home. Quietly and without fanfare, Northeastern University has risen in the college rankings over the past ten years, going from a New England university into an international hub of innovation and research. Its campus buildings have grown along with it. In 2017, the towering glass Science and Engineering Complex was completed, featuring a wide central atrium that extends upward through all six floors of the building. The architects worked closely with the Northeastern administration to create a building that honored transparency and exuded an energy and movement. Throughout the building, views of research spaces remain unobstructed through the use of glazed walls, offering anyone a peep in on what STEM students are up to in the laboratories. 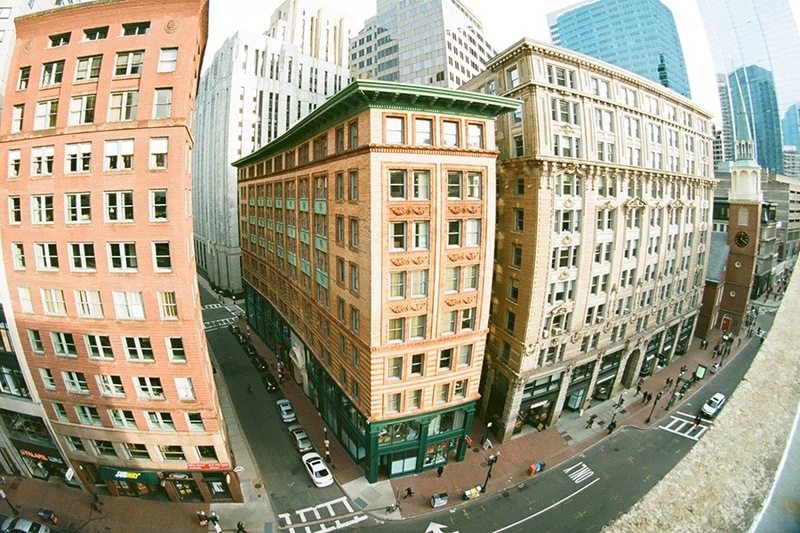 When you say “prime real estate” in Boston, you mean the Clafin Building. 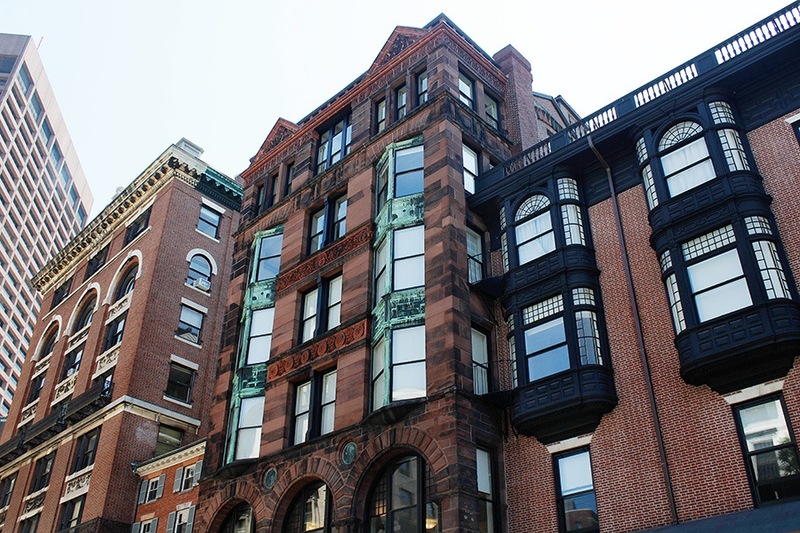 Steps away from the State House and the Common, the former Boston University building (now home to some of the most expensive apartments in the city) combines arches and carved brownstone with striking copper bay windows. This Art Deco structure looks like the hybrid of some moat-enclosed castle from the British countryside and the Chrysler building in New York. An unconventional combination, but it works. 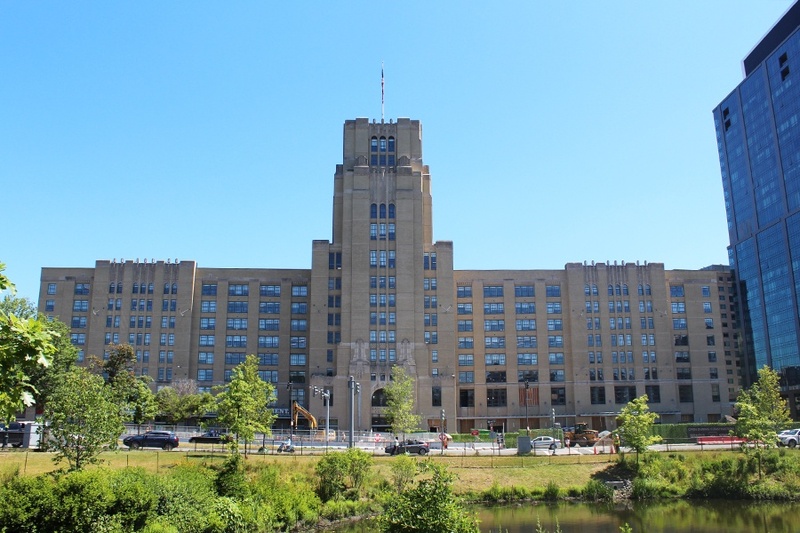 The building was first used as the Sears, Roebuck and Co. mail order store, and remains one of the best and largest examples of Art Deco architecture in the city. 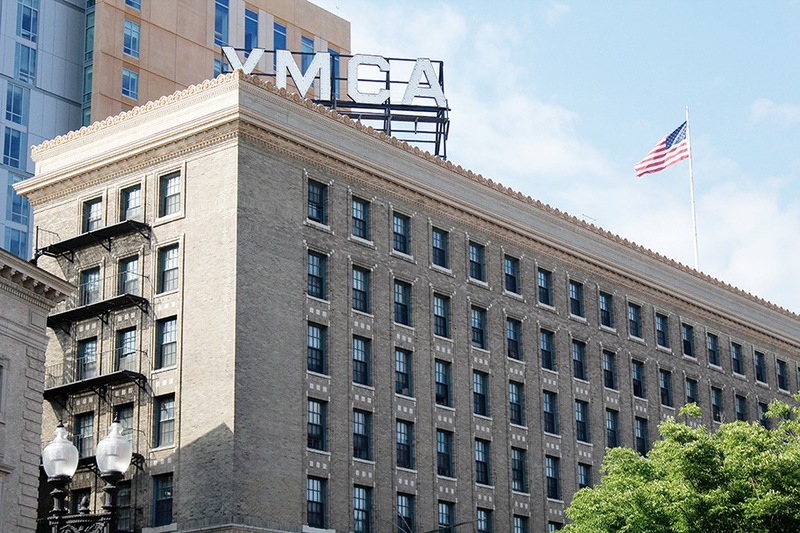 The Huntington YMCA is neat, rectangular, and perhaps best appreciated by Neoclassical architecture buffs. 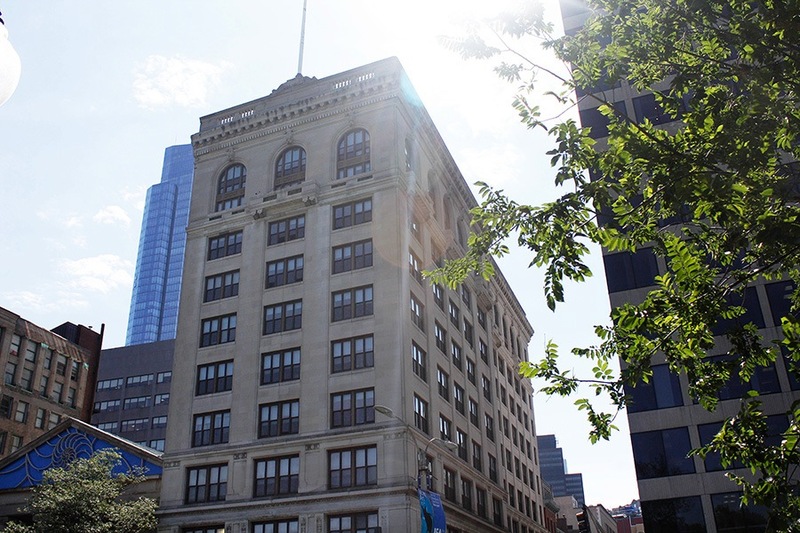 Though the rest of us might not find the subtle stateliness exceptional, the building’s history is certainly noteworthy–President William Taft laid the cornerstone in 1912 of the organization’s flagship building. In the late 19th century, the South End’s large population of Irish Catholics was in need of a place of worship, and someone decided that the spot of the former town gallows would do quite nicely. 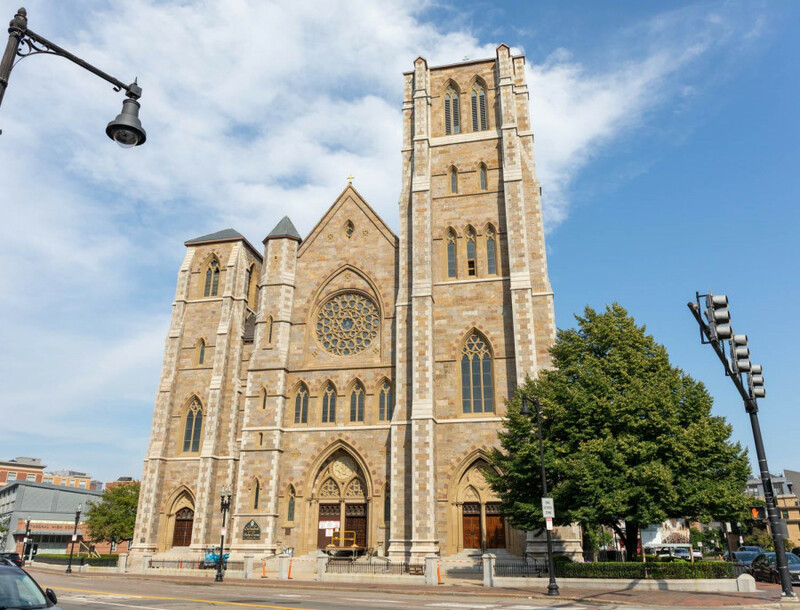 The Cathedral of the Holy Cross, built in the Gothic Revival style with Roxbury puddingstone and limestone trim, became the largest Roman Catholic church in New England—as large as London’s famous Westminster Abbey. 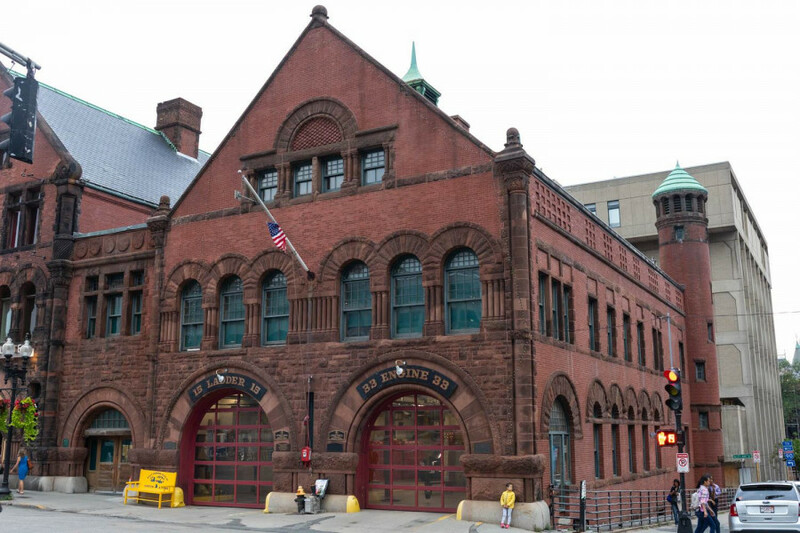 With a burnished brick facade and a Richardsonian Romanesque twin rooftop design, this vintage fire station—the first to house a ladder truck in Boston—is still active. Boston Fire Department Engine Company 33 and Ladder Company 15 take up half of it. Boston Architectural College purchased the other half in 2007. An enclosed courtyard that bridges the two buildings connects the twin rooftops. Back in the day, the courtyard contained shared stables for the fire and police horses. English immigrant and minister James Blake settled in the town of Dorchester in the 1630s. Soon afterward, he met his wife Elizabeth Clap. Allegedly, this modest house was built in preparation for their marriage. As the oldest house in Boston, the James Blake House certainly gets a lot of attention (and tour groups). 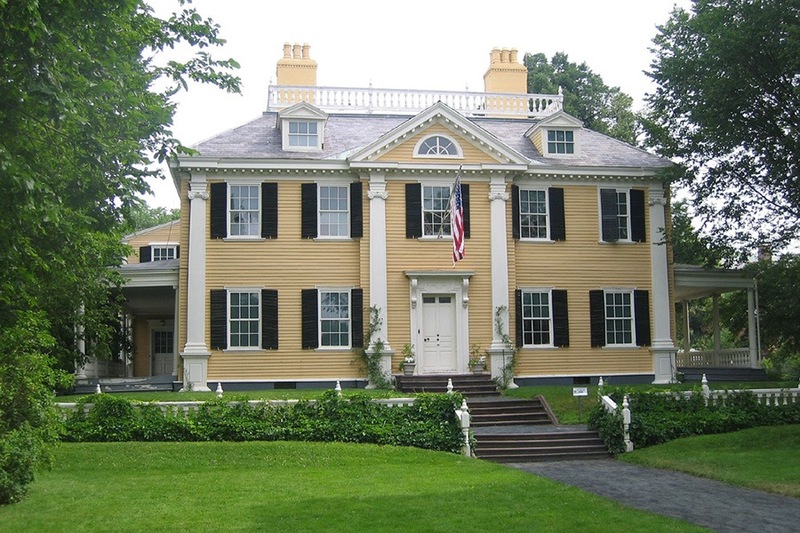 Though simple and unassuming, and built in the rustic Western English style of his time, Blake’s family home is distinguished for its history and age, and the dedicated preservation efforts of the Dorchester Historical Society. This building, plunked in the heart of downtown Boston, is an early example of the now widely used construction technique known as “skeleton framing,” where an interior skeleton comprised of the primary building material is fashioned before the rest of the structure goes up. 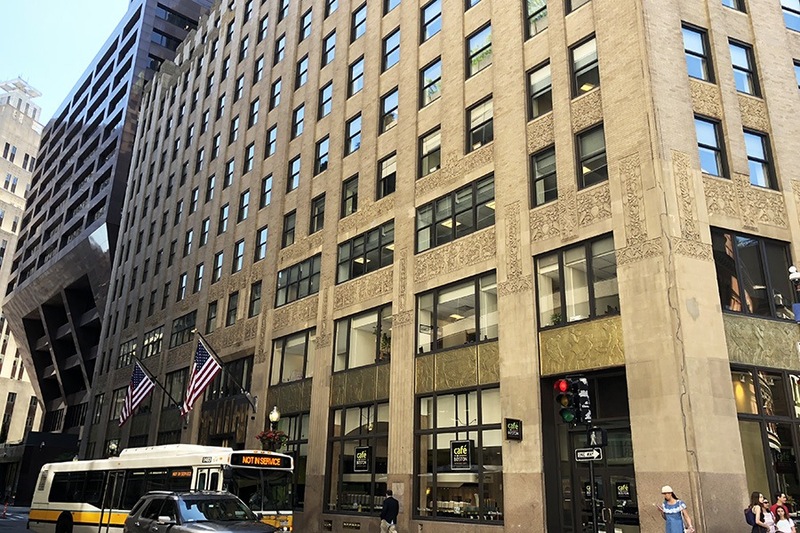 Originally built as the home office for the Old Colony Trust Company division of the Bank of Boston, this elaborately designed Beaux Arts office space had anthropomorphic figures carved into it by the 19th-century stone carver Max Bachman. The figures, which represent Commerce, Industry, Security, and Fidelity, linger between the windows of the second floor. 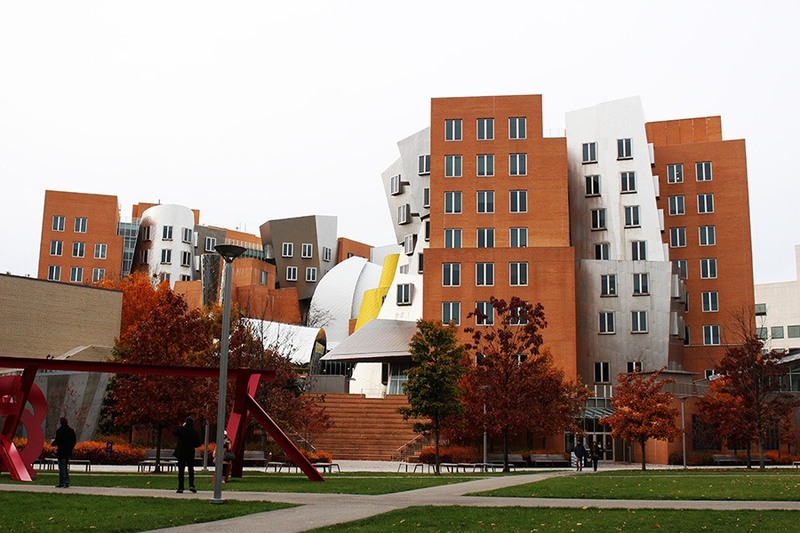 The Stata Center was the looney brainchild of Frank Gehry, one of the most prominent contemporary architects of our time (think Guggenheim Museum in Spain or Dancing House in Prague). 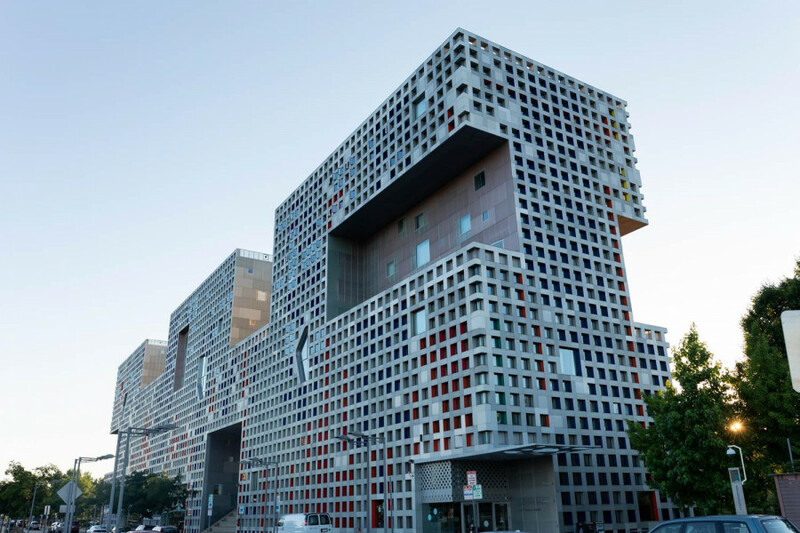 The center serves as a science building on MIT’s campus, presumably in the hopes that the cartoonish Deconstructivist design inspires students to think unconventionally. 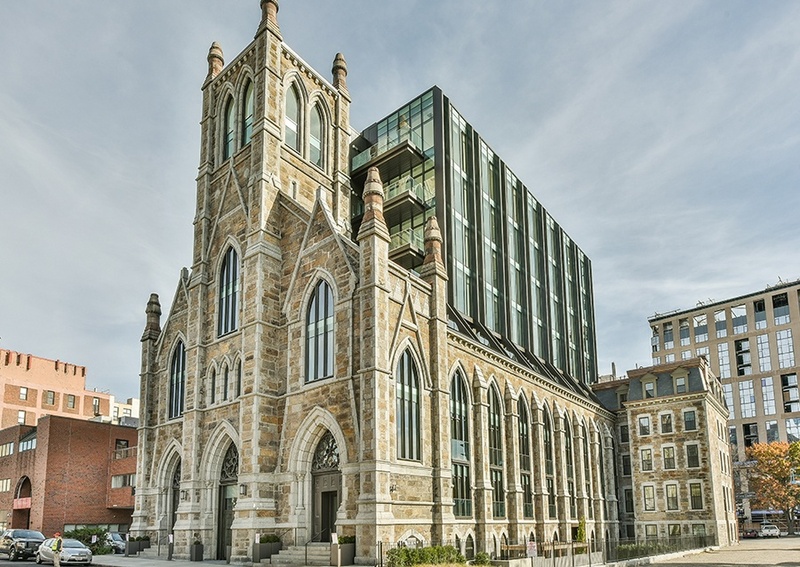 In 2017, the 19th-century Holy Trinity German Catholic Church’s former congregation space was completely transformed into luxury condominiums, while preserving the stately and historic Gothic puddingstone exterior. The resulting hybrid is a combination of the styles of two centuries—one comprised of rough rock, the other a geometric complex of smooth glass and steel. 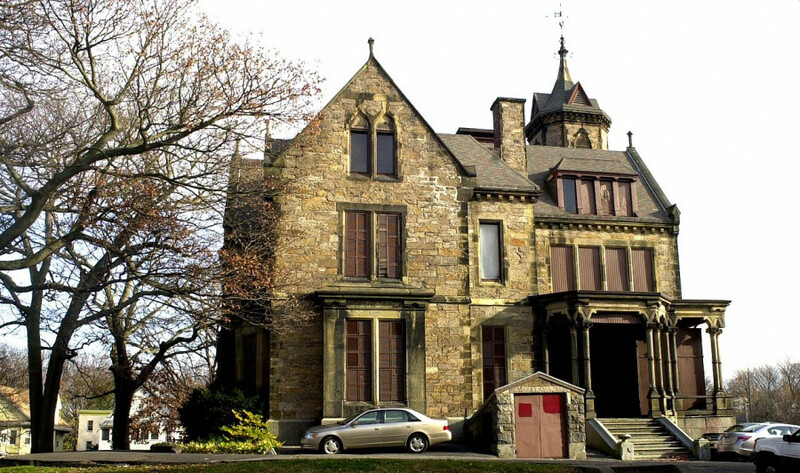 This impressive high Victorian Gothic mansion is built entirely from Roxbury puddingstone. 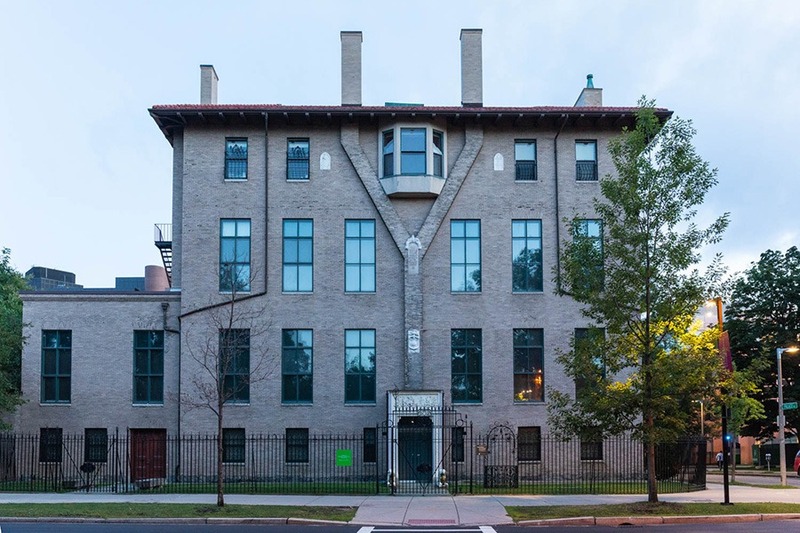 In its lifetime, the building, with its pointy window arches, has been a home for Boston Lead Works’ owner Aaron Davis Williams, a disciplinary school for boys, and now, the Museum of the National Center of Afro-American Artists. One of the Boston Public Library’s newest outposts takes neighborhood libraries from dark carpets and old computers to one modern, light-filled room. A swooping wooden roof and wall-to-wall windows offer plenty of light for reading, and yes, even mooching WiFi. 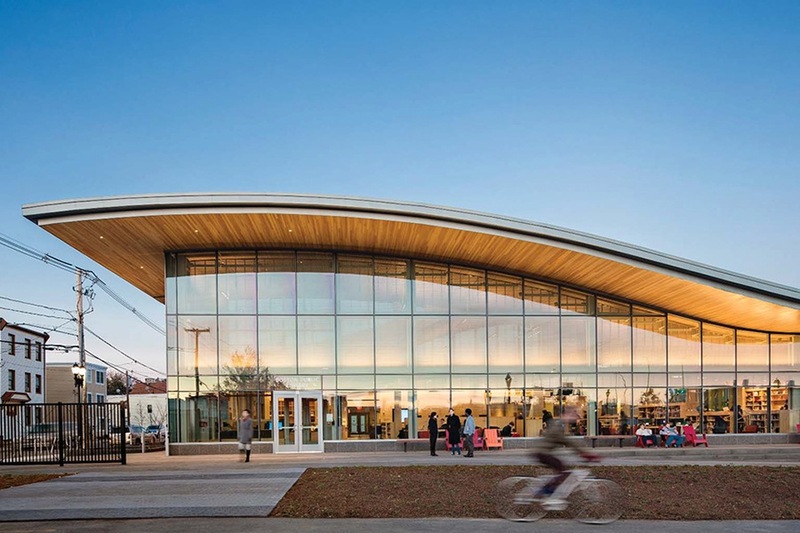 The Eastie branch is a reflection of the rapidly growing neighborhood it occupies—it’s LEED Gold Certified, looks out at an 18-acre park, and is surrounded by tiles that point to the top 21 countries of origin for East Boston residents. The building won the architectural honor of the Harleston Parker Medal in 2017. Look up at the Boston skyline in the evening and one building stands out—not just for its architecture, but for the image of the sunset sky that it mirrors. 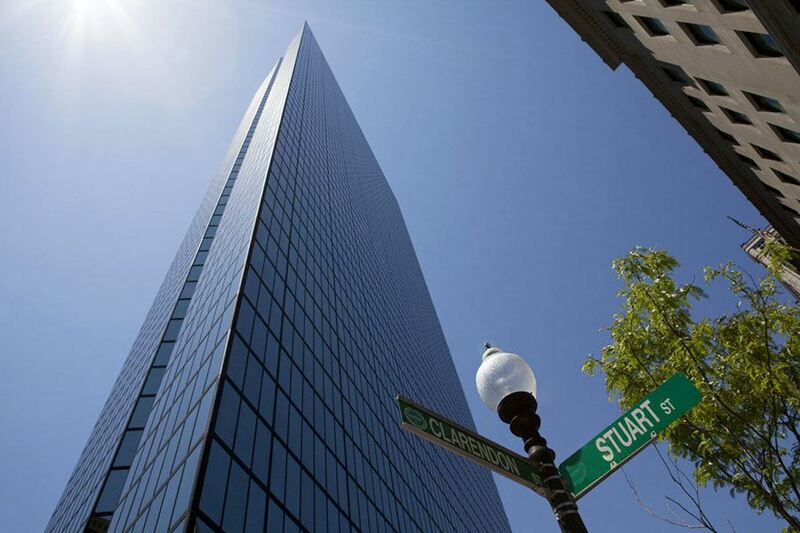 Millennium Tower’s crystalline exterior and sharp geometric angles give the building a futuristic appearance. And the luxury high-rise is certainly not an eyesore. In fact, it fixed one. 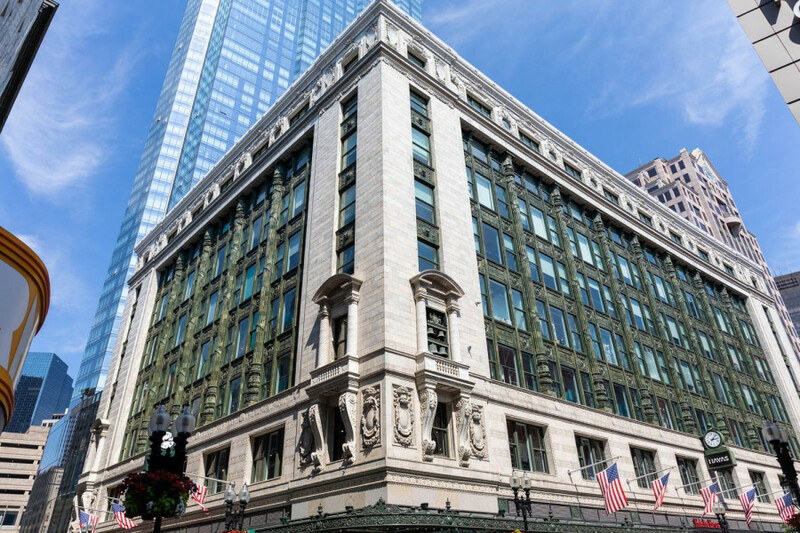 Part of the original Filene’s store was gutted before the 2008 recession, leaving a gaping hole in downtown Boston. Indeed, the city’s third-tallest building filled that pit with over 400 impressively expensive residences. It was supposed to be a colossal assembly hall. But to the disappointment of Tim the Beaver, the university opted instead to budget for a smaller lecture hall and the Barker Engineering library. 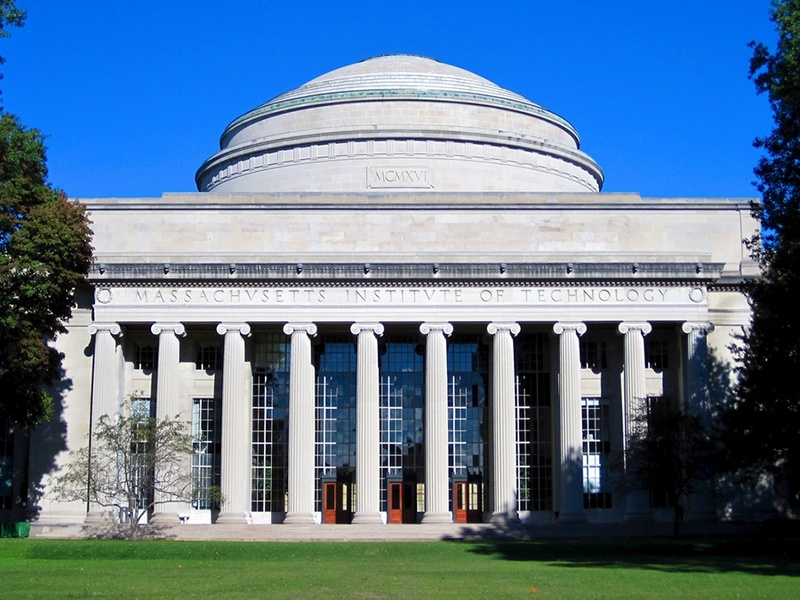 Still, the Neoclassical Great Dome and its perimeter of Corinthian columns is a commanding presence in the center of MIT’s campus—much like its inspiration, the Low Memorial Library at Columbia University. Both are modeled off of Rome’s famous Pantheon, though they worship knowledge in place of Roman gods. 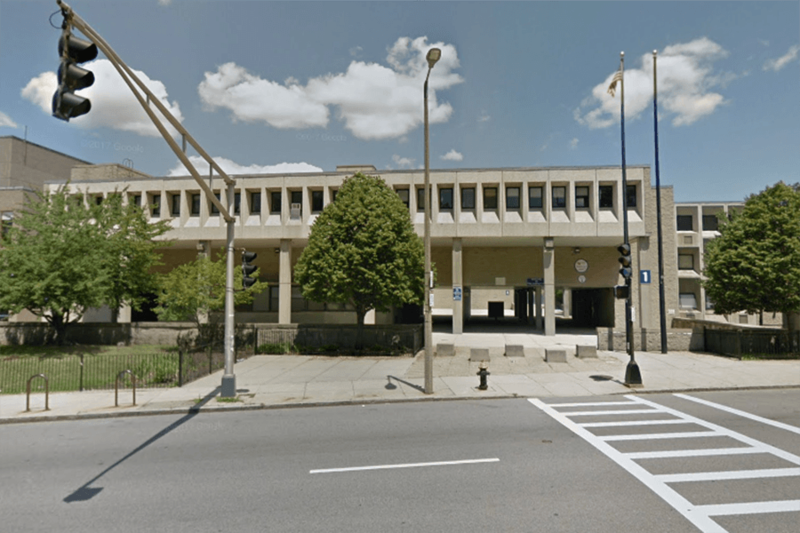 The late Mayor Thomas M. Menino had a dilemma: the Boston Public School department needed a new office building. Architectural firm Mecanoo had an idea. 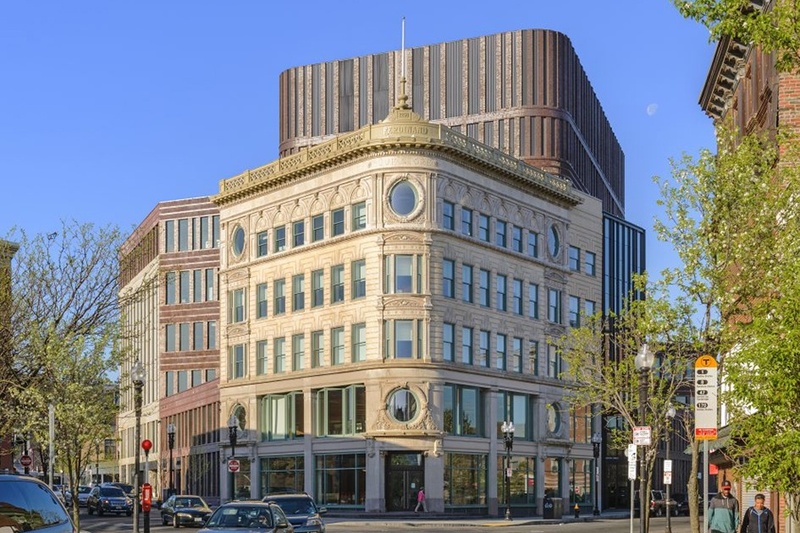 Starting with the attractive limestone and terra cotta facade of Roxbury’s historic Ferdinand building, the architects combined two more historic facades—that of the granite Waterman and red brick Curtis—to create a new Modern Baroque building. 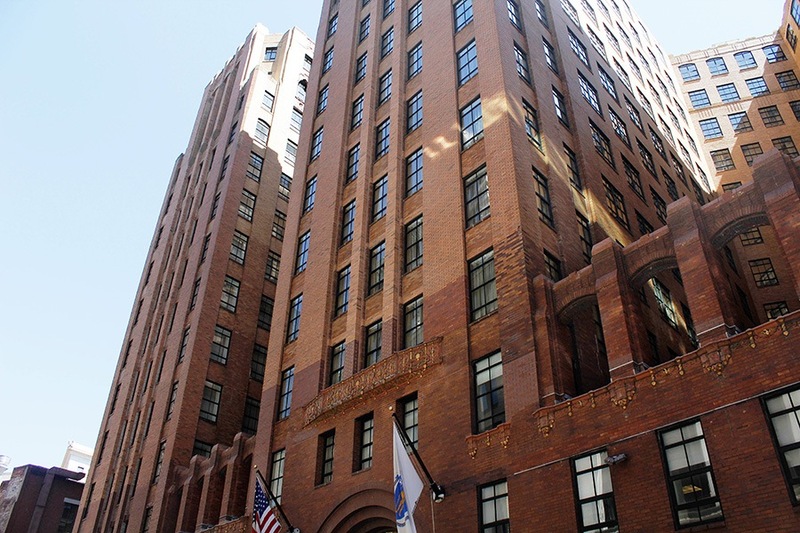 The combination of these facades makes the Bruce C. Bolling building—named for the first black president of Boston’s City Council—a unique fixture of Dudley Square. 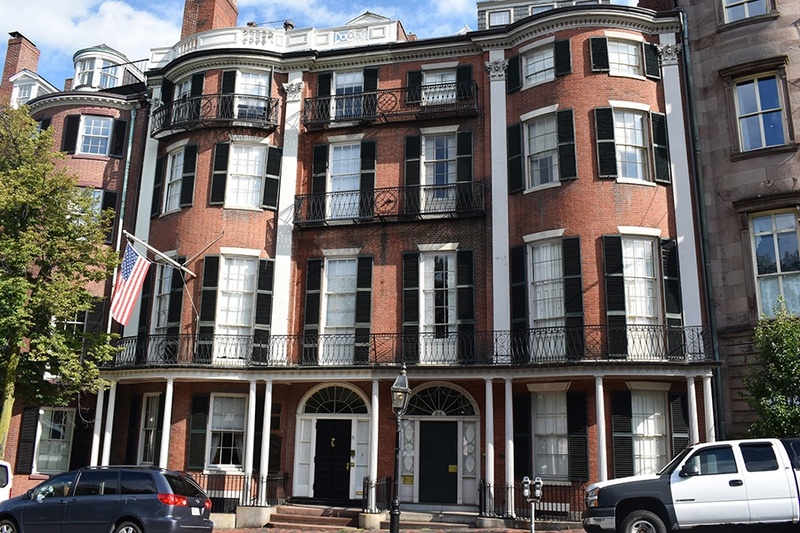 In 1818, textile manufacturer Nathan Appleton and his business partner, Daniel Pinckney Parker, tore down some old buildings on Beacon Street to build some brownstones. Their new twin townhouses, designed in the Greek Revival style, have stood there since, complete with Ionic columned porches and wrought-iron summer balconies. 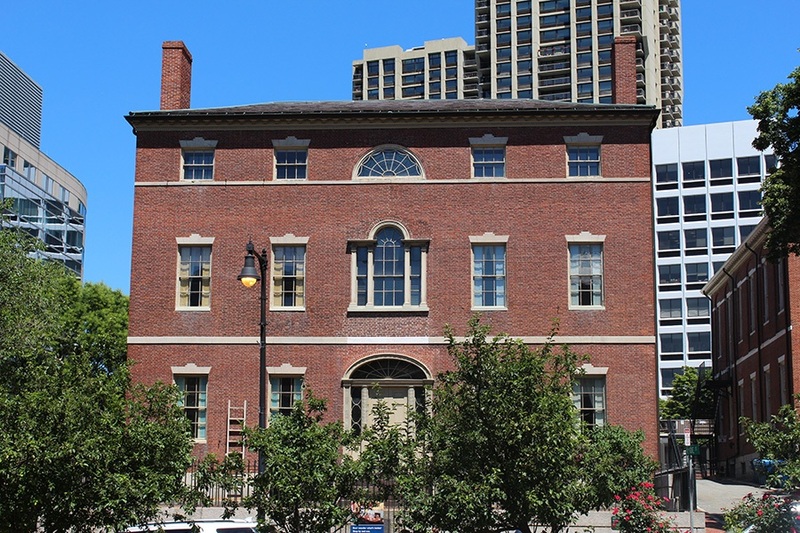 In 1843, the poet Henry Wadsworth Longfellow married Appleton’s daughter, Fanny, there, earning these red brick buildings a place in the National Historic Landmarks registry in 1977. Originally intended to be named “Boston Music Hall,” Symphony Hall houses the first auditorium specifically designed with scientific acoustical principles in mind. Modeled after a similarly striking building in Germany, the place is thought to be one of the finest concert halls in the world. 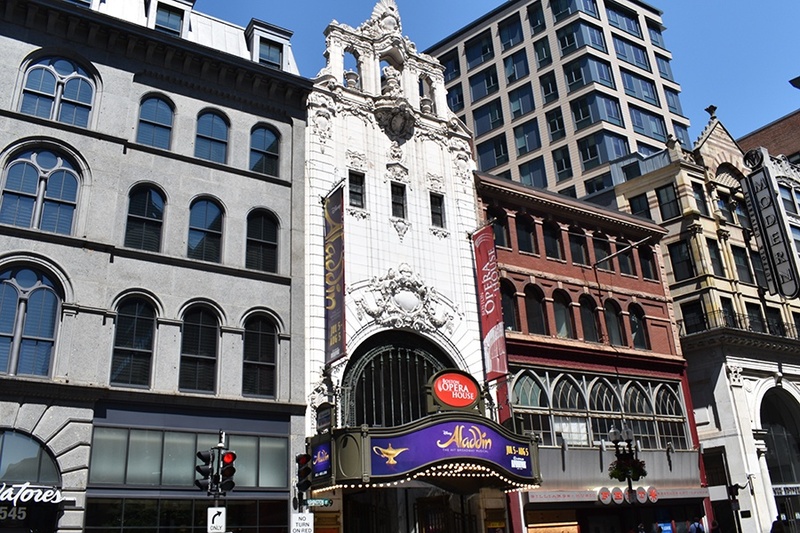 Before taking up residence in Symphony Hall, the famed Boston Symphony Orchestra spent a few years in the old Boston Music Hall on Winter Street. 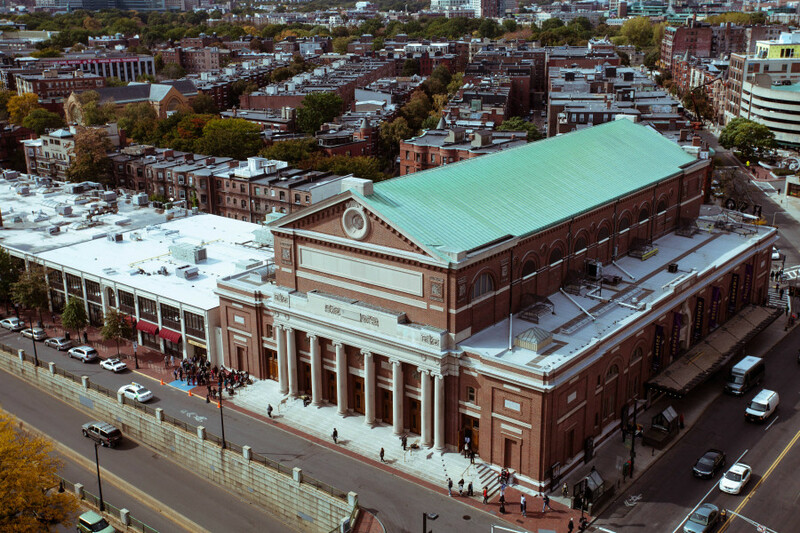 Founded in 1881, the BSO moved to Symphony Hall upon the building’s completion in 1900, with the Boston Pops Orchestra not far behind. Starting in the Roaring 20s, the opera house dazzled visitors catching movies on the big screen at what was then called the B.F. Keith Memorial Theatre. By the 21st century, the building became derelict, and an extensive restoration projection was launched to return it to its former splendor. The restoration brightened up the interior’s gold leaf finishing, Carrera marble, paintings, and tapestries. The grand staircases and chandeliers, as well as the oak and silk paneling were reinvigorated. Now home to the Boston Ballet, the Boston Opera House reopened with a show of Broadway’s “The Lion King” in 2004, and hosts enchanting performances of “The Nutcracker” every Christmas season. It’s a wonder to think that at one time, the Isabella Stewart Gardner Museum, formerly known as Fenway Court, was actually Gardner’s private home. The museum, inspired by Venice’s 15th-century Palazzo Barbaro, houses an enchanting four-story central courtyard, roofed in glass so that the natural sunlight streams in. Arches interspersed with colonettes surround the verdant courtyard, which guests can overlook through windows and balconies from the upper levels. Gardner’s influence on the design is profound, and her ownership lingers. When she died in 1924, her will decreed that the museum must remain exactly as she left it—with all her unique art and decorative furnishings in place. 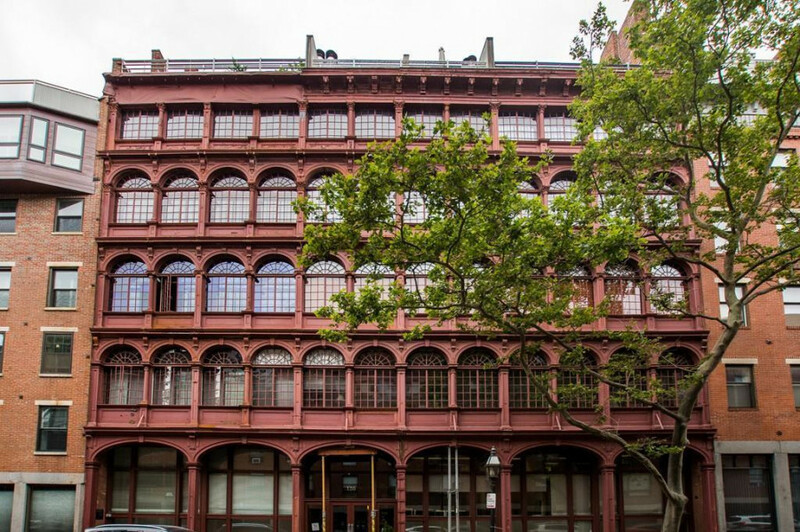 The McLauthlin building is one of New England’s earliest examples of a cast-iron and brick façade, a style often seen in New York but comparatively uncommon for Boston. The building used to be a manufacturing plant for the McLauthlin Elevator Company, but in the ‘70s it was converted into condominiums. The beautiful exterior remains mostly unchanged. The dark Quincy granite and imposing Ionic colonnade at the forefront of this landmark on the Freedom Trail certainly doesn’t look like it was thrown together, but parts of its parent structure were. Thrown out the window, that is. 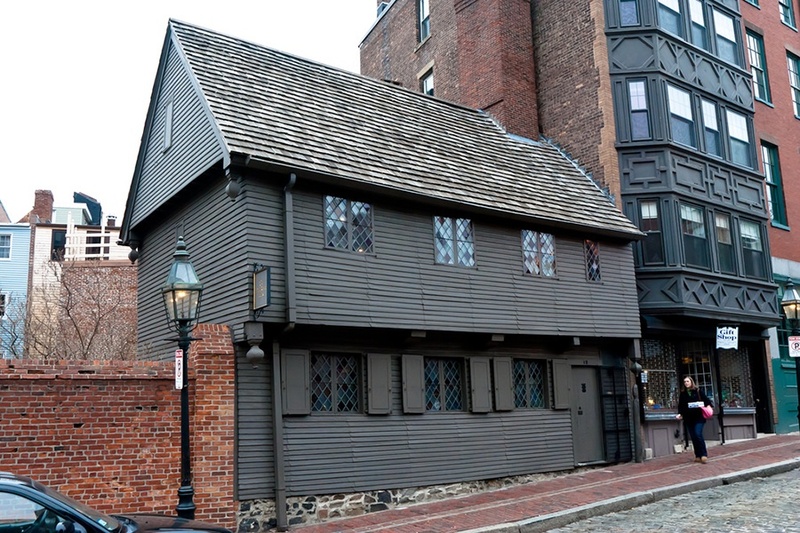 The original building, a small wooden chapel, was crafted for Anglican British officers, making it very unpopular with Bostonians in the neighborhood. The new Georgian-style chapel was built around the existing wooden structure so church services could continue during construction. When it was finished, builders disassembled the old wood and literally chucked it through the church’s arched windows. These days, historic King’s Chapel is just steps from City Hall, and serves as an independent, Christian Unitarian congregation. You might recognize the inside of it from the early 2000s comedy Boston Legal, as the show’s Crane, Poole & Schmidt law firm occupied the 14th, 15th, and fictional 28th floor. This rose-granite, postmodern behemoth towers over Copley Square. 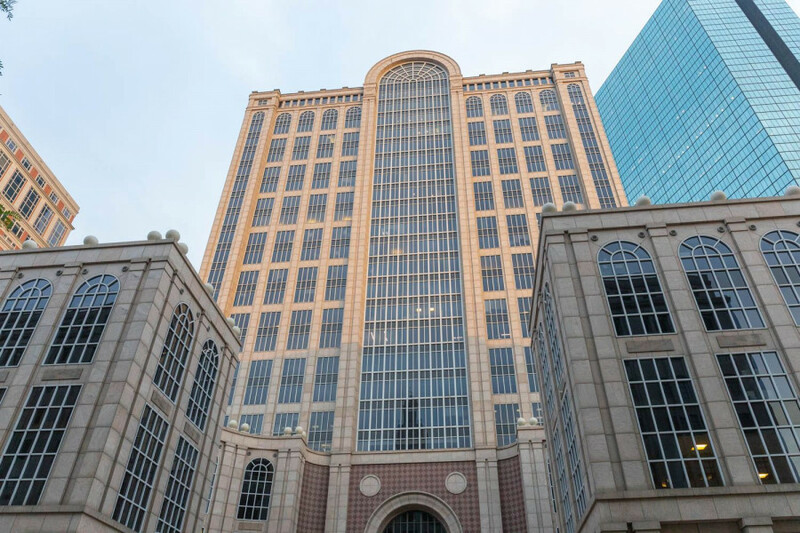 What makes 500 Boylston truly phenomenal is its entrance courtyard, composed of two symmetrical “wings” made up of soaring columns. The First Baptist Church’s shadowy walkways and creeping vines offer a peaceful respite from the noisy city streets. The building is a gorgeous Romanesque bastion, similar to nearby Trinity Church, done by the same architect. The Baptist church, however, was Richardson’s first church in the city. The spectacular friezes on the building’s tower were designed by Federic Auguste Bartholdi, who also happened to design the Statue of Liberty. The Mother Church of Christian Science looks more like it belongs in Renaissance Italy than the Back Bay. The original design, by Mary Baker Eddy herself, was in the style of a more traditional New England church before it was expanded in 1906 to the ornate landmark it is today. The final touch, the portico with its Corinthian columns, was completed in the ‘70s. Serious and imperial, this building fits with the swishing of black robes, the bang of a gavel, the suggestion of justice being served. 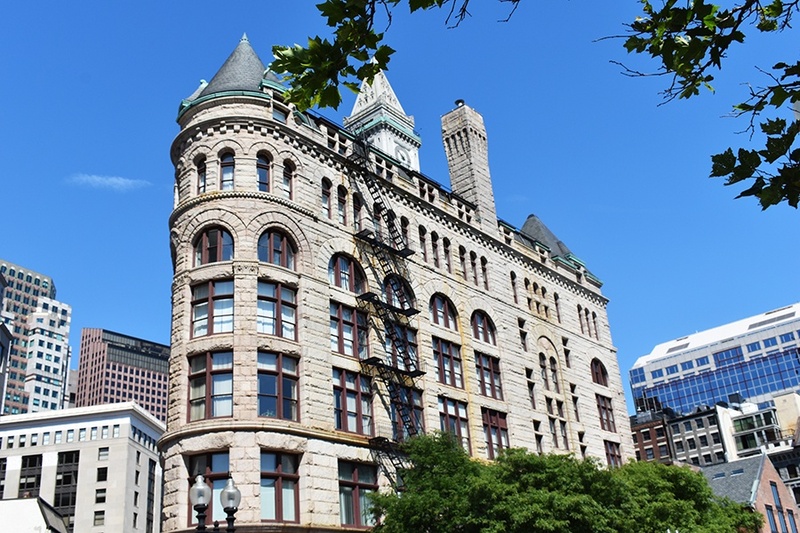 The classical structure, also known as the John Adams Courthouse, was originally a little shorter, but in 1909 the state decided that law and order required more room, so the architect added two stories. 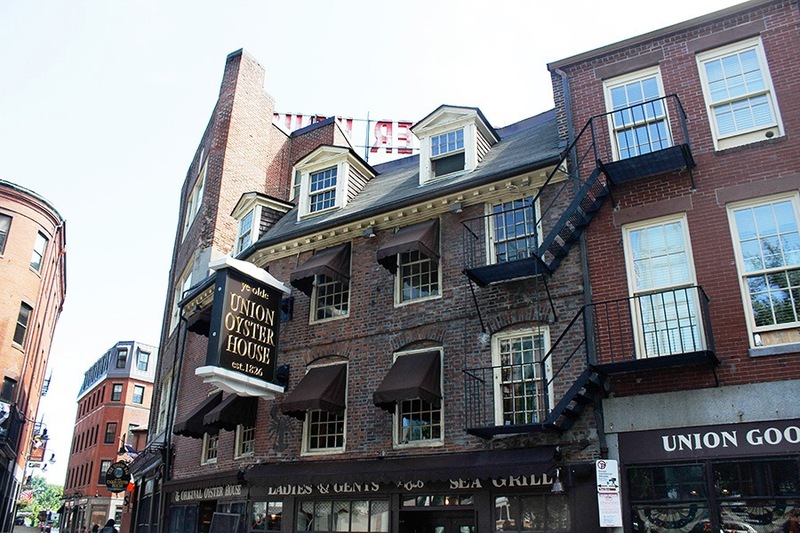 The Union Oyster House is as a part of Boston as the streets themselves. This immovable Georgian cornerstone of the city seems to have stayed the same since 1826. The building has hosted numerous high-profile guests over the years, even serving as the hidey-hole for Louis Philippe, King of France, from 1830 to 1848 during his exile. 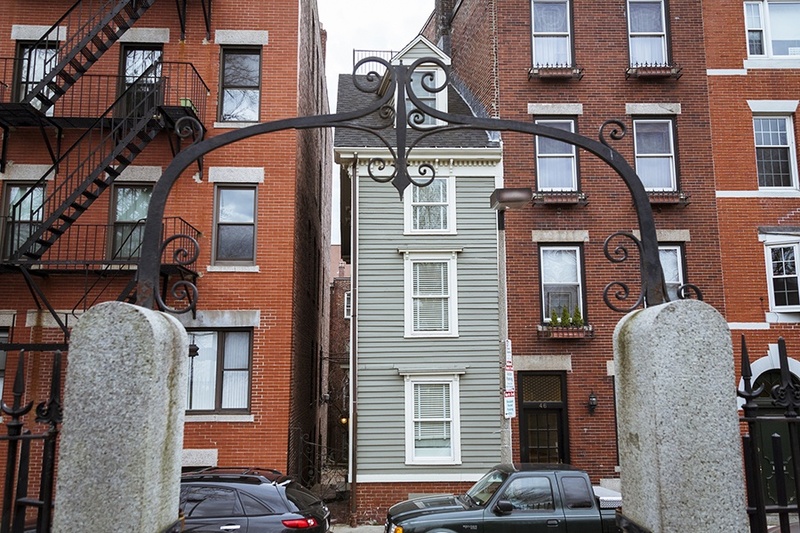 The Otis House, a beefy hunk of history straddling Beacon Hill and the West End, is the neighborhood’s last holdover from the original Bowdoin Square days. (So, none of that urban renewal stuff.) It’s a landmark example of Federal style, a perfect cube of brilliantly preserved red brick with none of the frills. It was moved backward during street widening in 1925. This Beaux Arts staple is clean and classy, fitting for an elite hotel. The Fairmont’s limestone details and buff brick walls are understated yet impressive, and the plaza view isn’t so bad, either. It was built on the original site for the Museum of Fine Arts. It was only 100 years ago that Boston’s smallest neighborhood, Bay Village, was a hub for film distribution. Art Deco-style warehouses sprang up in the early 20th century, including this one at 115 Broadway. 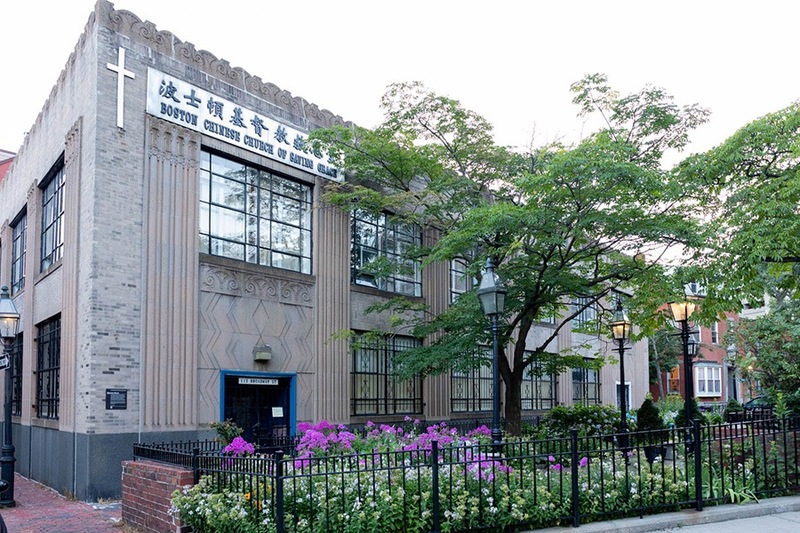 Built for 20th Century Fox, the boxy building is now home to the Boston Chinese Church of Saving Grace. You can still glimpse its columns, scallops, and Art Deco flourishes from the street. This heavy building is not subtle. Huge and powerful is more like it. The Federal Reserve Bank stands solidly over the city like some angular cousin of the Easter Island heads. It’s sometimes called the “washboard building,” for obvious reasons. Nestled between two brick buildings in the North End, this pale green structure was built in 1884 out of spite. According to legend, two brothers inherited a plot of land in the neighborhood from their father. After serving in the Civil War, one brother came home to find that his brother had built a large house on their shared land. Miffed, he built what’s been affectionately dubbed the Skinny House, blocking sunlight and his brother’s views of the harbor. 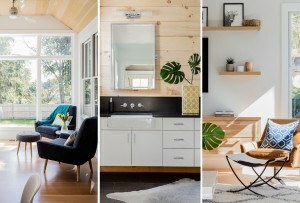 The 1,166-square-foot abode is about 10 feet wide by 30 feet long. It also has no front door from the street—the main entrance is in a side alley. 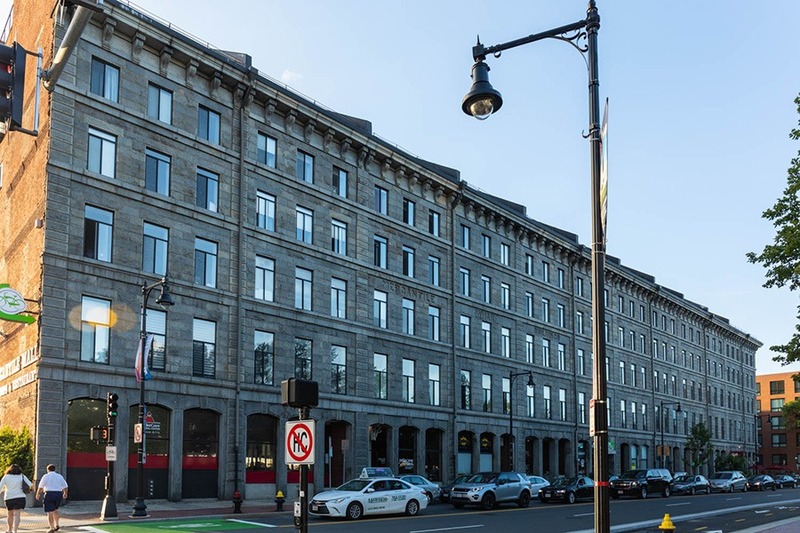 Built in the French Academic style to suit its original use as Boston’s Museum of Natural History, the building that now houses a Restoration Hardware showroom is more than elegant enough to match the wares it sells. A recent renovation by Backen, Gillam & Kroeger updated it with a modern glass entryway and a glass-walled elevator that anchors the center of the showroom, surrounded by luxe chandeliers and mirrored arches. Image courtesy of Rasky Partners, Inc.
One Dalton, set to open as the Four Seasons Hotel & Private Residences in late 2018, rises 61 stories in Back Bay. 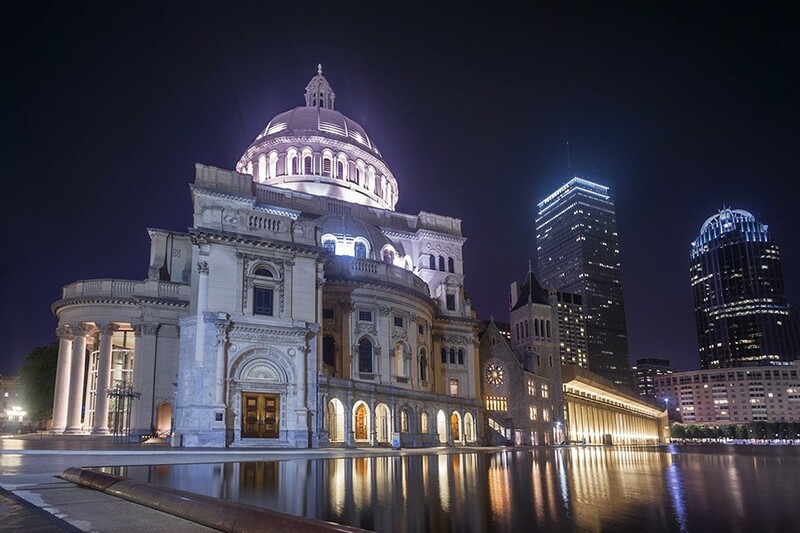 It stands just across from the Christian Science Center Administration Building done by I.M. Pei, Cobb’s longtime friend and cofounder of his firm, Pei Cobb Freed & Partners. 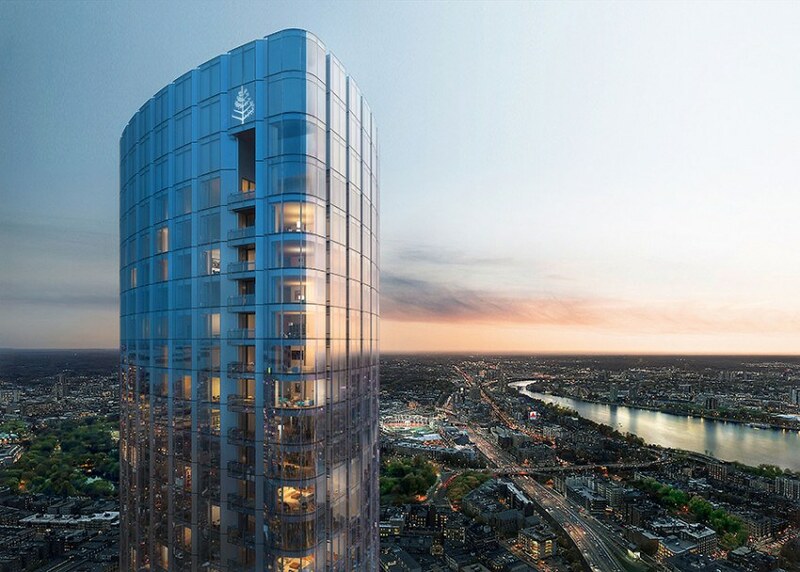 Poised to be the tallest residential tower in New England at 740 feet high, the building is clad entirely in glass. It’s meant to resemble a “soft triangle,” with three curved faces and three distinct sections meant for public space, hotel rooms, and private residences. 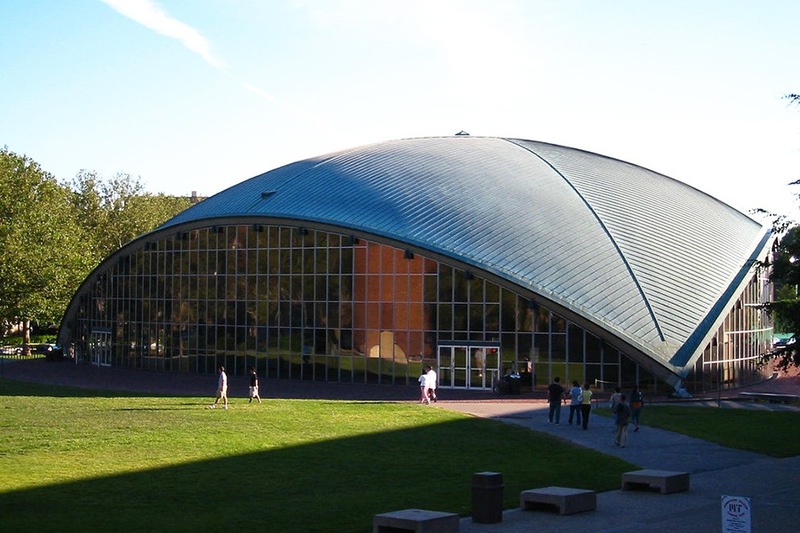 Like some huge, pearlescent leaf, this artful auditorium’s domed roof is expertly balanced on just three points. It’s actually the third roof since 1955—the original white orastone was replaced with lead sheeting and finally copper in the 1980s. Copper was the preferred material of Eero Saarinen, but in the ‘50s, it puzzled builders how to implement it. The Ether Dome is the crown on the Bulfinch Building, property of Mass. General Hospital. Its rounded roof can be seen at the center of the Greek Revival structure. Visitors are allowed to check out the inside of the dome—it’s a former surgical amphitheater where ether was first used in an operation. In addition to being a stunning sculpture of concrete and glass, the Architects’ Corner has quite the history. The sparkling gem among Cambridge’s bricks was a neighbor for the home of architecture dream team The Architects Collaborative—made up of eight influential architects including Walter Gropius. It was also the site of legendary (and now defunct) retailer Design Research, founded by The Architects Collaborative member Benjamin Thompson, as well as the offices of Sert, Jackson & Associates, and Benjamin Thompson & Associates. 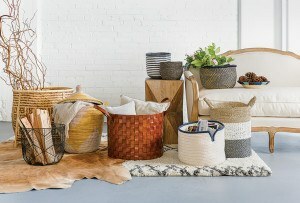 In recent years, the grouping of buildings has housed Crate and Barrel and Anthropologie. The building at 42 Lomasney Way stands eerily and singularly, and with a startling amount of open space around it. Known as the Last Tenement, the three-story, yellow brick structure is the last vestige of the old West End, pre-Urban Renewal. It somehow survived when the neighborhood around it was razed, and stayed standing as train lines, highways, and the TD Garden sprang up around it. It’s been clad with billboards for years and is still home to a few lucky tenants. The Athenaeum is cited as one of the first major examples of the revival of Italian Renaissance architecture. According to the Society of Architectural Historians, it became a popular style of building for cultural organizations in the late nineteenth century. As one of the country’s earliest membership libraries, the Athenaeum was created with space for both art and books in mind. In 1913, two floors were added to the building. They were set back so as not to disturb the original facade of the building, and brought it to a total of six levels, including the basement conservation lab. 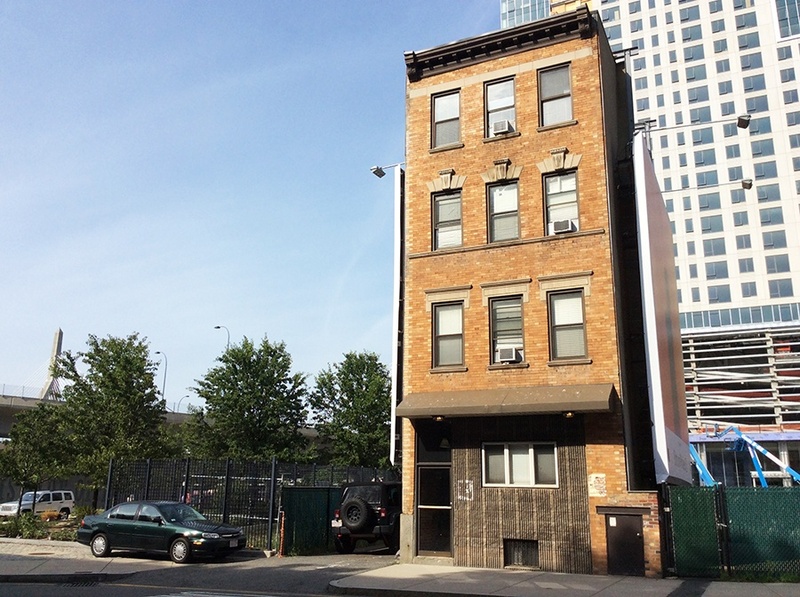 The little abode at 220 Clarendon St. has stood proudly (albeit its height) since 1883. 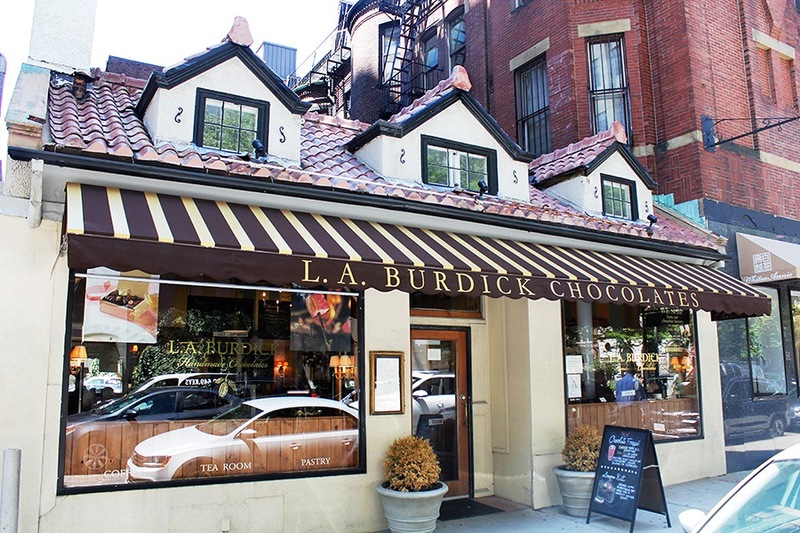 More than a century later, in 2012, L.A. Burdick’s opened at the spot. An infinitely delicious—and somewhat unexpected-looking—chocolate shop seems to be a perfect fit for the cozy stucco house, no? 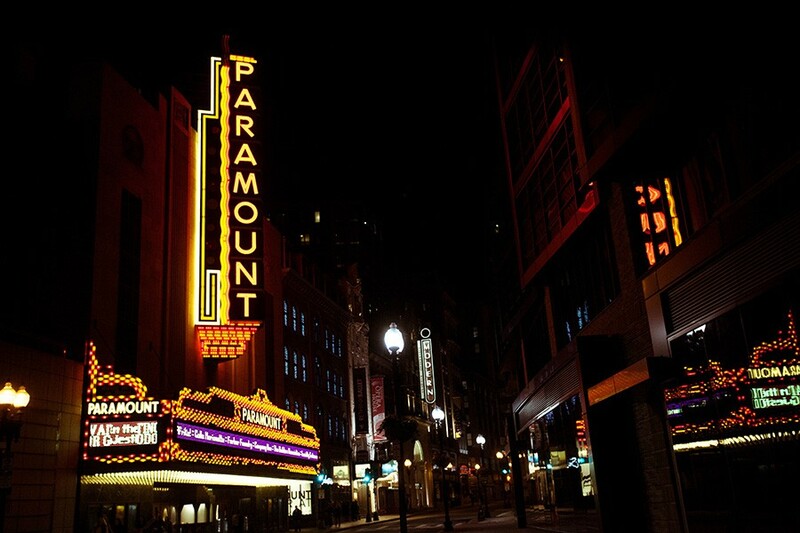 Before the AMC or the Regal, if you wanted to see a movie in Boston, you had to head to the Paramount. With timeless Art Deco details inside and out—from the primary-colored marquee and sign painted with scenes from mythology, the now-Emerson College-owned theater is a trip back to a time when popcorn and a ticket didn’t cost you your entire paycheck. It looks like a chateau that belongs in the French countryside, but Albert Burrage’s mansion sits right on Comm. Ave. Turrets, balconies (plural), and intricately carved moulding reflect Burrage’s taste for the finer things in life—shared today by former resident Tom Brady. 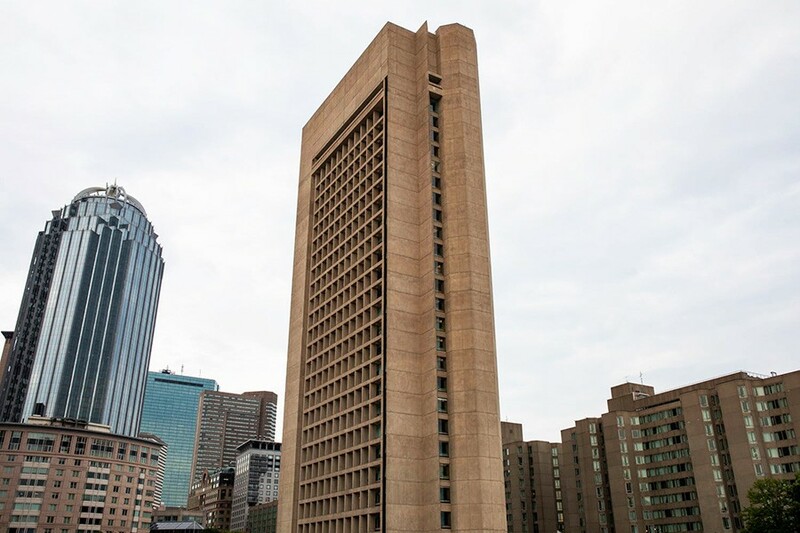 Another example of Boston’s fraught relationship with Brutalism, the Harbor Towers soar —or loom, if you dislike them—40 stories over the waterfront. 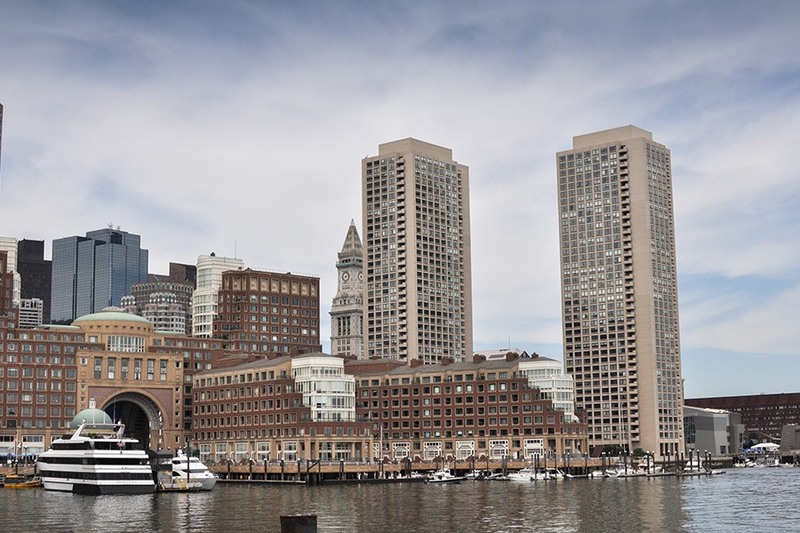 The towers, which are some of the only high-rise buildings along the harbor, are sandwiched between the Aquarium and the boats lining Rowe’s Wharf. While we happen to like them, the city is divided on how it feels. This impressive Federal-style construction stands apart from its fellow brick neighbors, thanks to unique rounded bay fronts and white columns. It was built overlooking the Common in 1808 for a merchant named James Smith Colburn, and on land once owned by portrait painter John Singleton Copley to boot. In 1845, historian William Hickling Prescott moved into the house, and about a century later, it was purchased by the National Society of Colonial Dames. The home is now open as a house museum select Wednesdays and Saturdays. 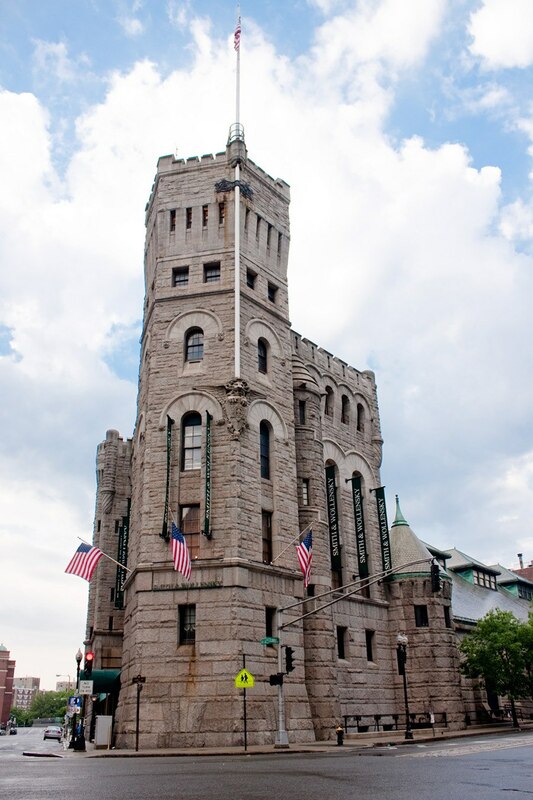 Once an impenetrable armory for the First Corps of Cadets, then later (well, until May 2018) a Smith & Wollensky steakhouse, this medieval-style castle is an Arlington Street icon. If you were to climb all the way past that beautifully laid stonework and stand on top of the tower, you would be able to send a signal to the State House. You couldn’t expect a response, though, as it hasn’t been used as a military post in over 50 years. 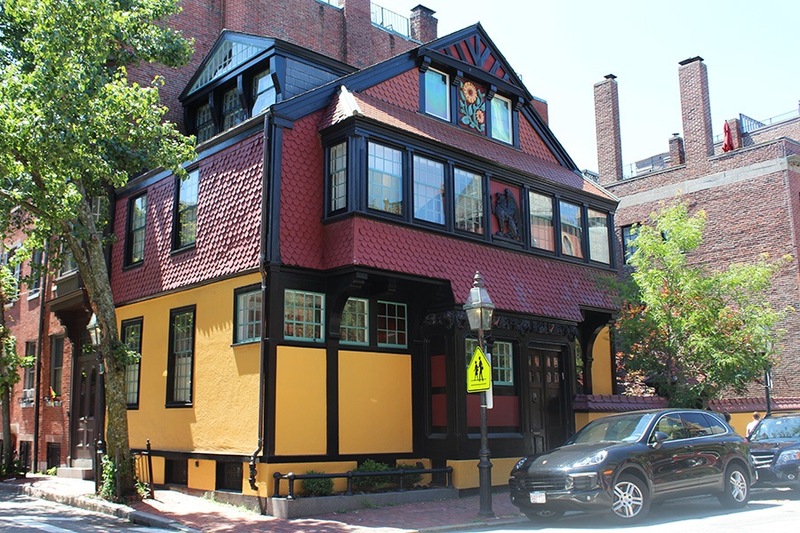 Architecturally, this Elizabethan Tudor-style house is just another example of the abundant Colonial-era buildings around Boston. Even so, it’s pretty cool to see where Paul Revere spent his time when he wasn’t announcing impending revolutions. 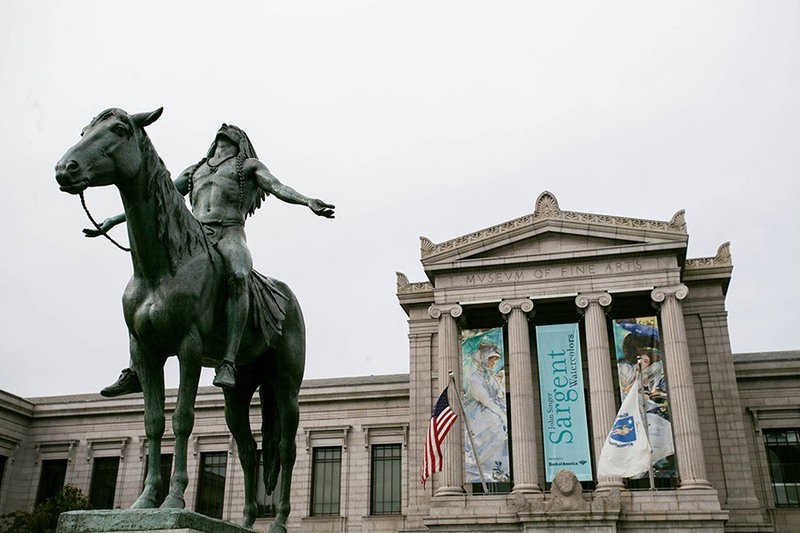 The MFA is a masterclass in Classical architecture, inside and out. Visitors walk under Ionic columns at the entrance, climb up into a rotunda under a dome and wander through galleries whose ceilings are decked with moulding and coffers. 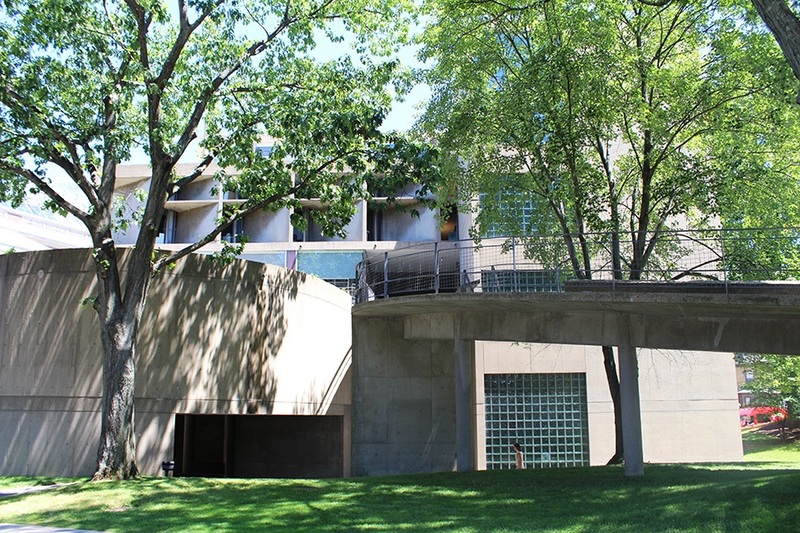 Although the exterior is uniformly Beaux Arts, new wings and galleries inside come from the modern, postmodern, and even quasi-Brutalist movements. On the former site of Anne Hutchinson’s wood-framed house stands the Old Corner Bookstore, now home to a Chipotle and a Bruegger’s Bagels. 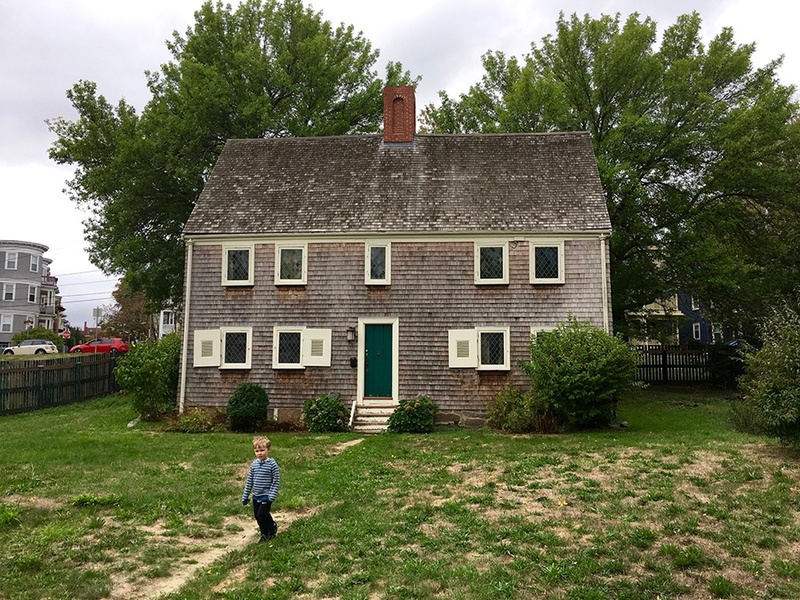 Later, Thomas Crease built the current sloping gambrel-roofed structure to house his apothecary before it was turned into the Ticknor & Fields (Little Women, The Scarlet Letter) publishing house. If it’s possible for one structure to look like an office building, castle, and medieval church all at the same time, the Flour and Grain Exchange does just that. Its crowned turrets jut out from a Romanesque base with the style’s signature rounded windows, all done in pink Milford granite. 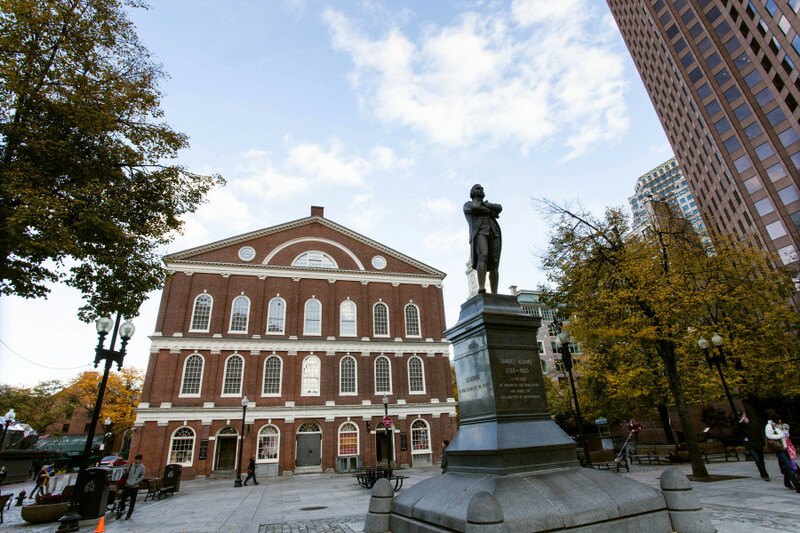 “Cradle of Liberty,” “home of free speech,” or “tourist trap”—whatever you call it, Faneuil Hall is one of Boston’s most-visited and most-recognizable buildings. 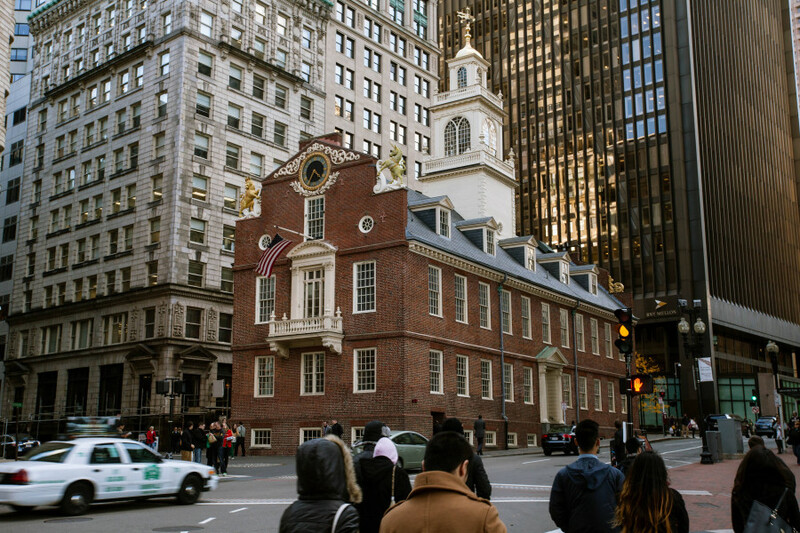 Originally built in a severely traditional fashion to house meetings and markets for the city of Boston, Charles Bulfinch swooped in around 1806 to double its width, add a floor, and move the cupola from the middle to its iconic perch at the front end. 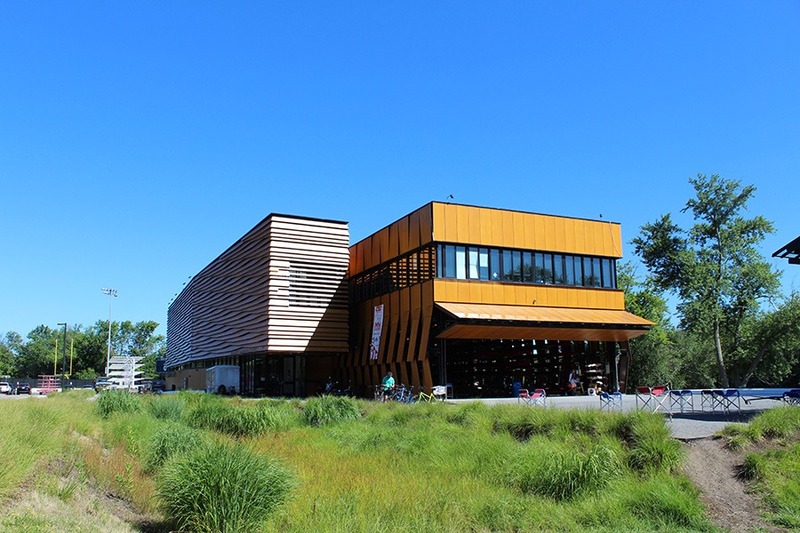 The nation’s largest public rowing organization has sick digs. The boathouse, one of the few on the Charles not owned and operated by a college, looks out on the water with huge windows and lets the breeze in with wood panels that resemble the river itself. 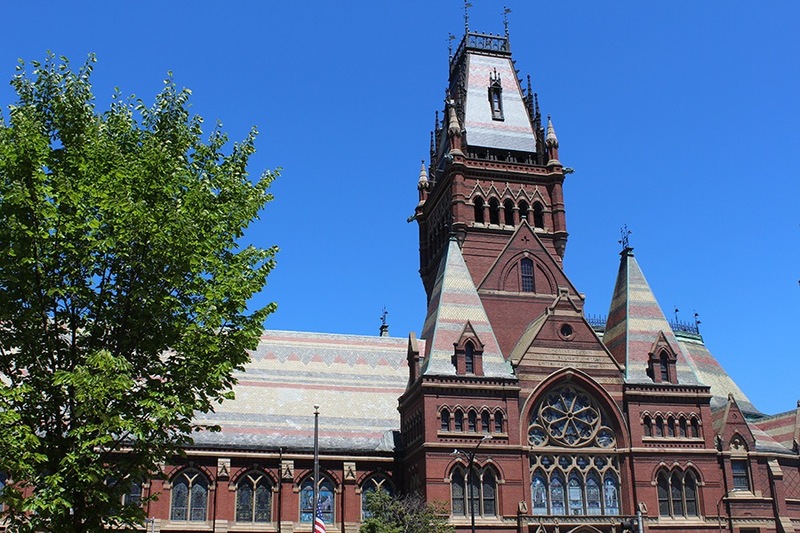 To a small child, Memorial Hall looks like just another one of Harvard’s red brick buildings. Grow a little taller and you can appreciate the High Gothic building’s stained glass windows and beautifully patterned roof, tiled in alternating blue, tan, and red stripes and triangles. The crown jewel is the structure’s tower, iced in red and blue and complete with a zig zag design. 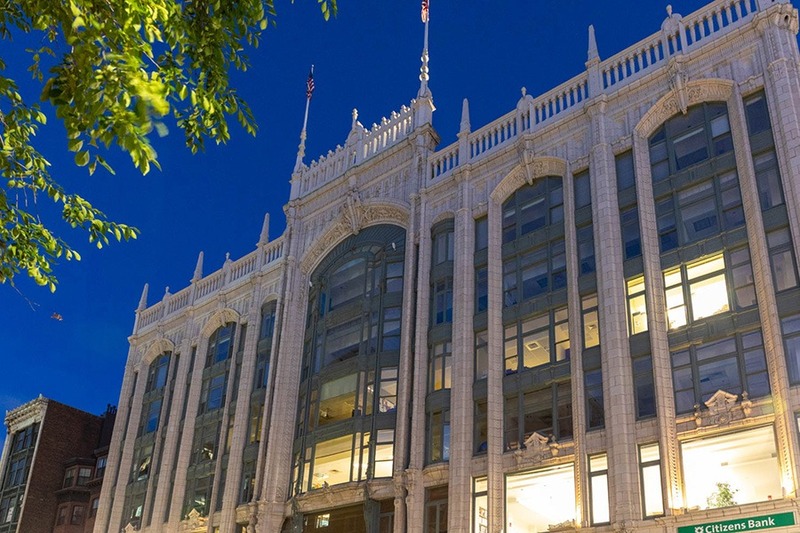 Saved from the wrecking ball in 1983 by Emerson College and subsequently restored by Elkus Manfredi Architects, the Cutler Majestic is, well, majestic. From the outside, arches frame a trio of Tiffany stained-glass windows flanked by fluted Ionic columns. 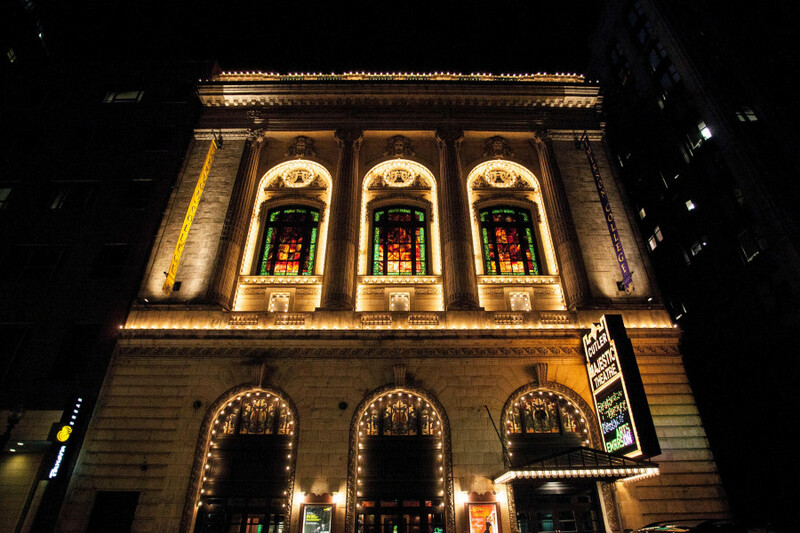 The theater’s splendor is further accentuated by intricate stone carvings of fruit atop each window, surrounding three theater masks depicting happiness, sadness, and anger. Inside, the atmosphere is Edenlike, as the ceiling is designed to resemble a heavenly trellis with patches of blue sky. Another brick Georgian building from Colonial times, the Old State House doesn’t have a fancy gold hat like the new one, but it has a heck of a history. It was the site of the Boston Massacre and the place where the Declaration of Independence was first read, to start. Its facade boasts a beautifully decorated clock and statues of a lion and a unicorn. A time capsule from 1901 was found inside the lion’s head in recent years, and then replaced with a new capsule in 2014. 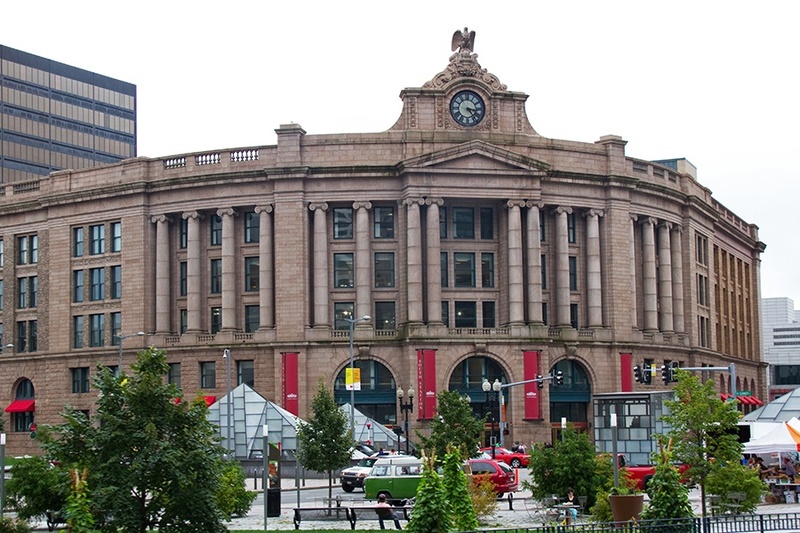 Architect: Shepley, Rutan & Coolidge; Norcross Bros.
Like a tiered wedding cake, South Station is a masterpiece of Neoclassical architectural highlights. 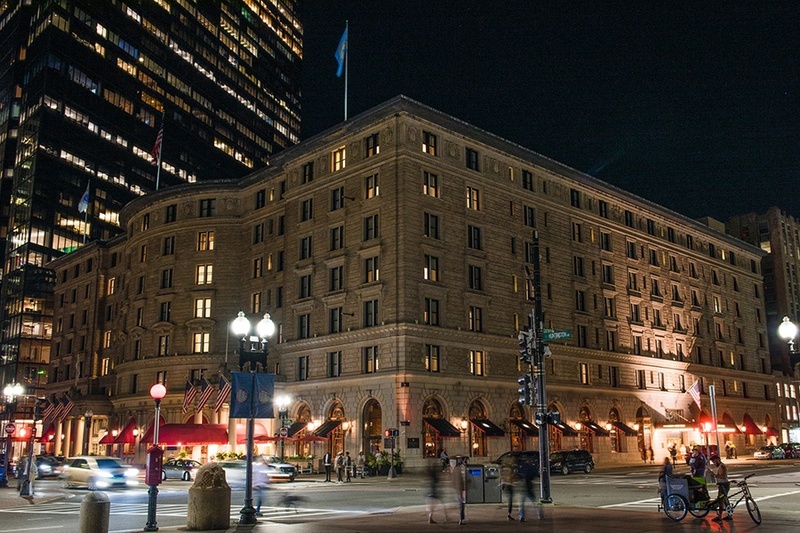 The Beaux Arts landmark is one of Boston’s grandest gatekeepers and has a regality befitting its function. Behold the only Le Corbusier creation in the entire United States. 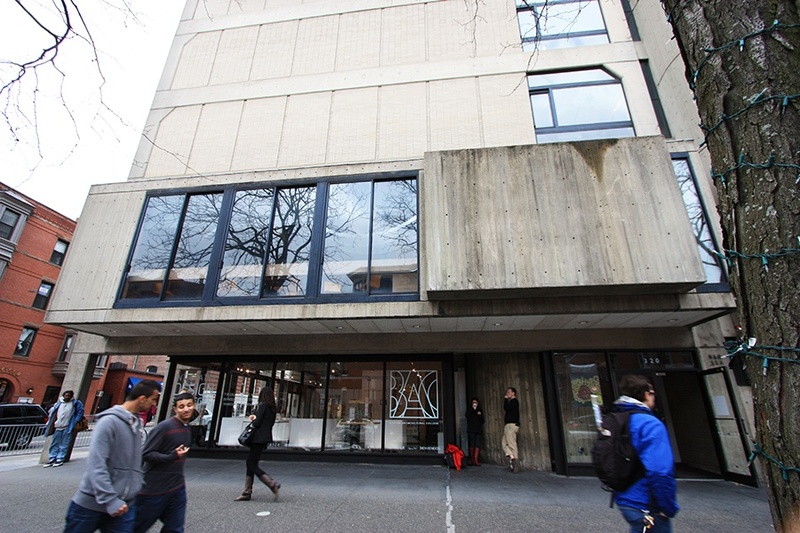 Located on Harvard’s campus in Cambridge, this Modernist building serves as the university’s art center. Every side of this funky structure reveals a unique perspective. You’re bound to appreciate at least one. 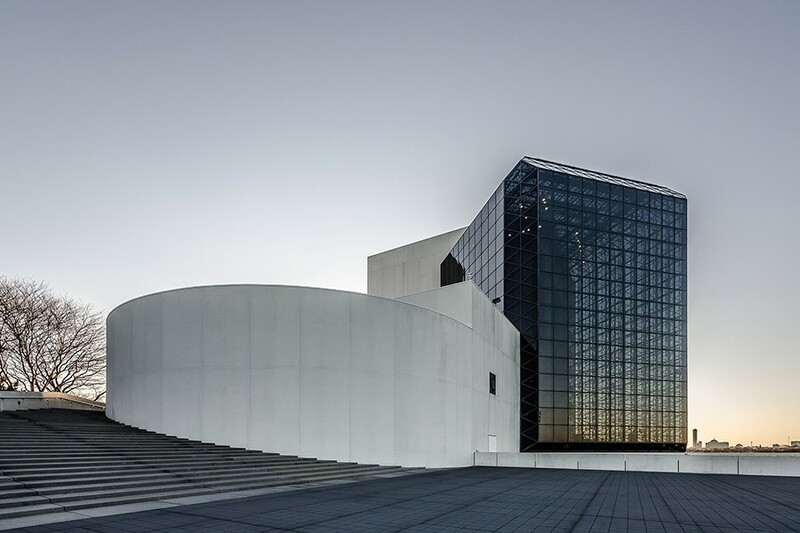 The John F. Kennedy Library & Museum revels in simplicity. Finished in 1979 on scenic Columba Point (after considering eight different sites) the I.M. Pei creation overlooks the sea. A bright, white nine-story pyramid anchors the structure, connecting to a two-story cylinder-shaped building with help from a parallelogram of grey glass. According to the Boston Society of Architects’ AIA Guide to Boston, the glass housing the 110-foot-high Presidential Pavilion is an architectural statement to its importance. When Horticultural Hall opened in 1901, its first residents were some of the city’s brightest—and best-smelling: azaleas, geraniums, trumpet lilies, palms, wisteria, and hundreds of orchids dazzled visitors. But today, instead of flowers, the English Renaissance-style building’s atrium is home to the offices of this very publication. 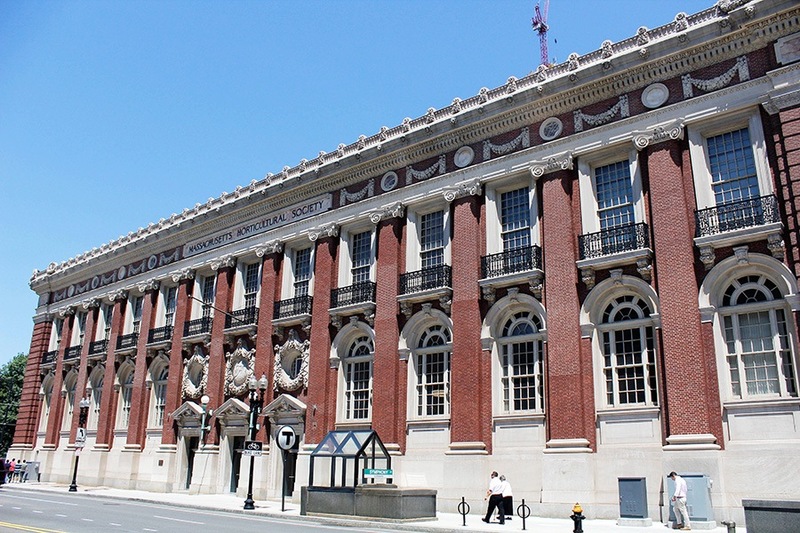 Built as the third Horticultural Hall in Boston (the other two have since been demolished), the structure flaunts huge pilasters, wreaths, and stone garlands of fruit and plants. It was designed by Edmund March Wheelwright, an influential architect and great-uncle of architect Harry Cobb, who also designed the Longfellow Bridge, Harvard Lampoon Building, and the Massachusetts Historical Society, among other Boston buildings. One of only a few Saarinen buildings in New England, the MIT Chapel is a midcentury wonder. From the outside, its curving brick walls make a statement on campus. Inside, however, they take on a whole new meaning. 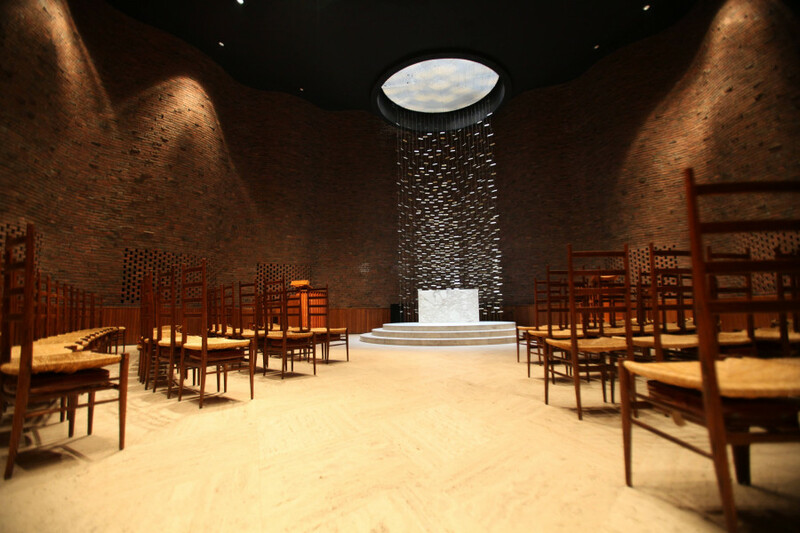 A circular skylight carved out of the ceiling provides the only light source for the non-denominational center for worship. A hanging sculpture by Harry Bertoia suspends in this light, cascading all the way down to the floor. With the cylindrical walls as a backdrop, the space emanates an otherwordly sense of calm. Some say it looks stupid, but the Lampoon Castle’s silly brick facade, built to resemble a face with a hat, jibes perfectly with the world’s second-longest continually published humor magazine’s eclectic vibe. Its hat—sorry, its roof—is topped with an ibis statue, at least when it’s not being stolen by the Crimson staff. Most go for the food or the spectacle, and this building is rarely free of the hordes. 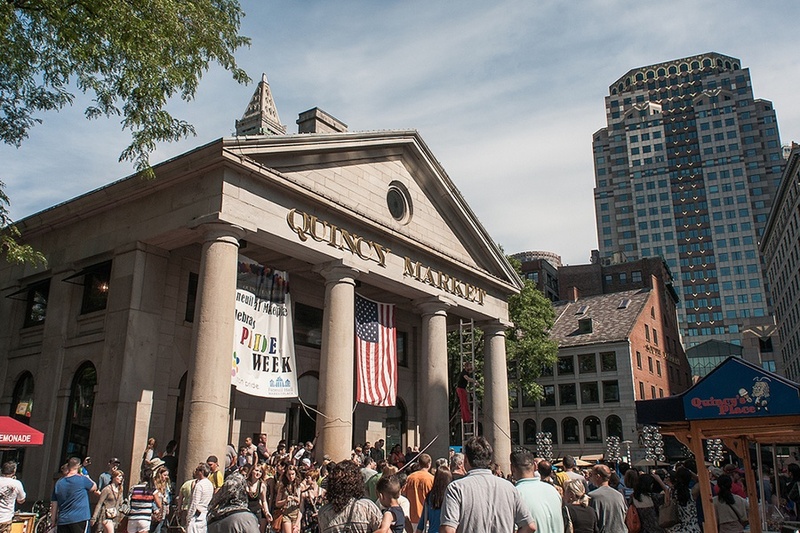 But take a breather next time to appreciate Quincy Market’s grand old Greek Revival columns and the imperial cornices that have overlooked the busy streets since 1742. 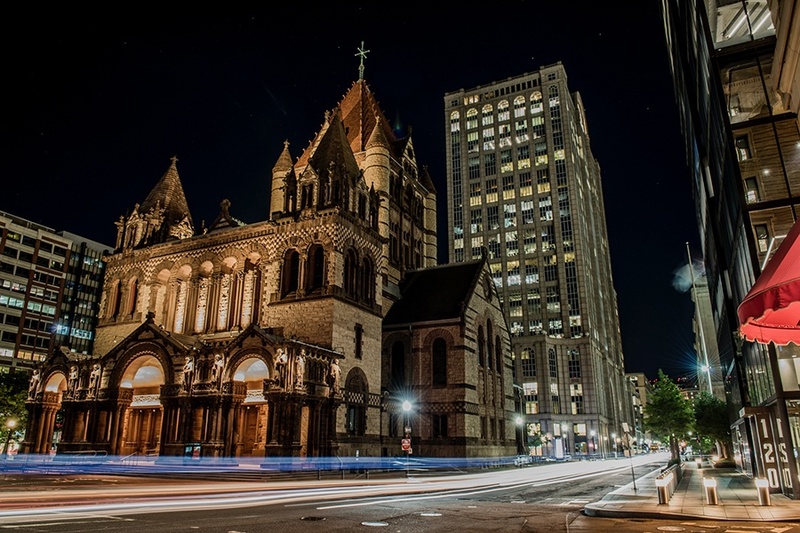 The Old South Church is truly a part of Boston—it’s literally built out of the bedrock that lies underneath Roxbury. It’s a proud member of the High Victorian Gothic architectural family, with ornate wrought iron and red and gray stonework. Yes, it’s got that super-visible campanile, but the Old South Church also has a “lantern” (or a copper-covered cupola) on top. The State House is renowned as a landmark of Federal architecture, and its trim exterior certainly exudes a business-like regality befitting a government building. 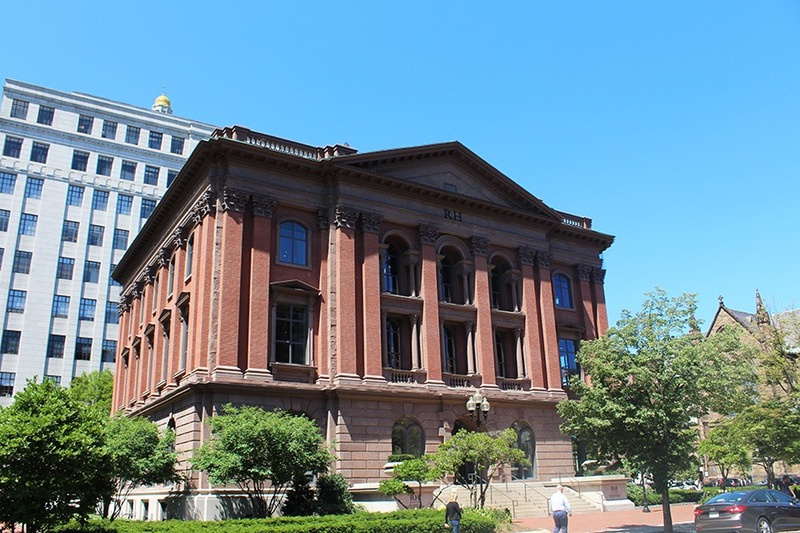 The architect, Charles Bulfinch, was a true Bostonian through-and-through, and the clear choice for the State House’s designer. 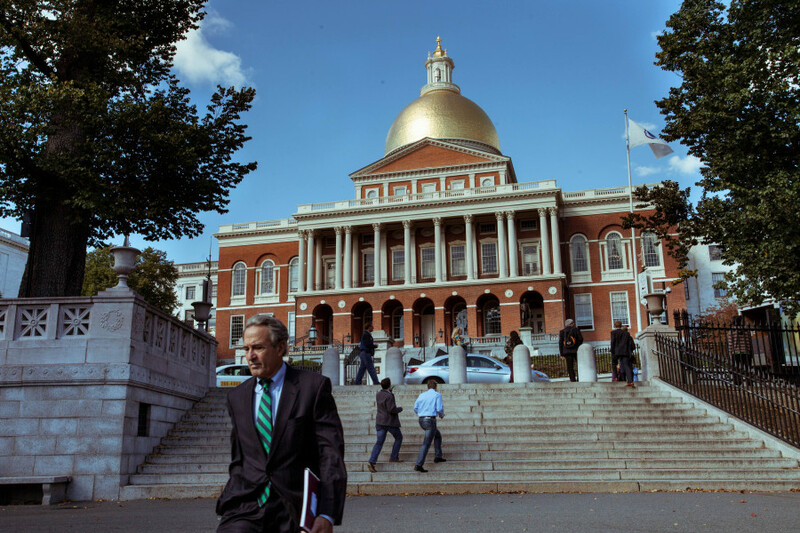 Bulfinch was born and raised in the city, and though he worked on several projects in the development of the U.S. Capitol, he never strayed too far from Boston. The copper for the State House’s original dome was supplied by the company of another important Bostonian, Paul Revere. Yep, that Revere. 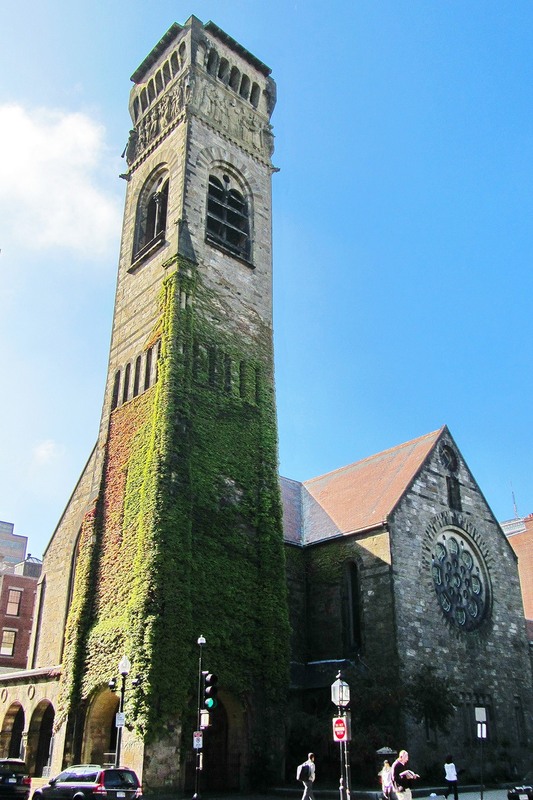 Trinity Church is a Gothic interlude to the commercial Newbury Street neighborhood. With its cast of stone-faced gargoyles, the impressive building looms over passers-by like some huge medieval chess piece. Its auditorium was designed to reflect the emerging democratic spirit of the late 19th century. The overall style was dubbed Richardsonian Romanesque after the architect. Despite its name today, Old City Hall was a refreshingly new style of building upon completion in 1865. 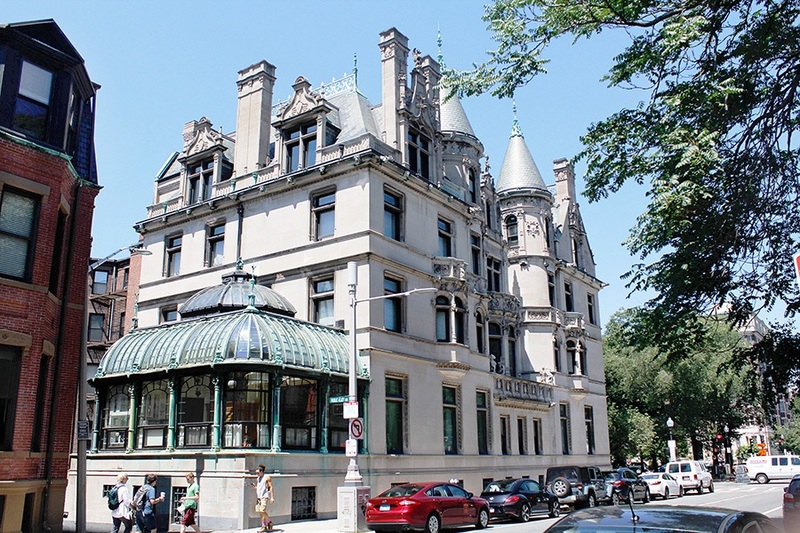 Its architects, Arthur Gilman and Gridley James Fox Bryant, drafted a design never before seen in Boston, borrowing from the new addition to the Louvre in Paris to build one of the first French Second Empire structures in the United States. A protruding central pavilion dominates the 80,000-square-foot building, topped by a sloping mansard roof—a hallmark of French Second Empire design. 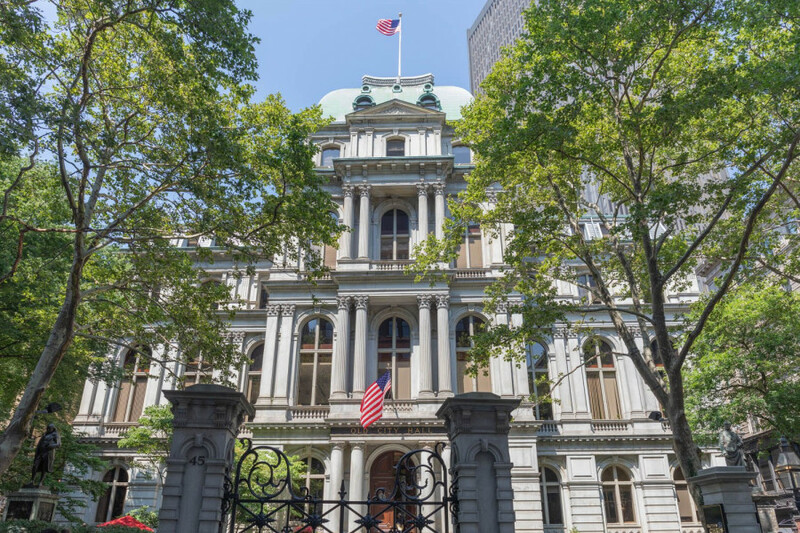 At one point, the Boston Redevelopment Authority talked of demolishing Old City Hall, but an early example of adaptive reuse saved the place. Now it’s home to a Ruth’s Chris Steakhouse and several offices. Better than a pile of rubble, eh? 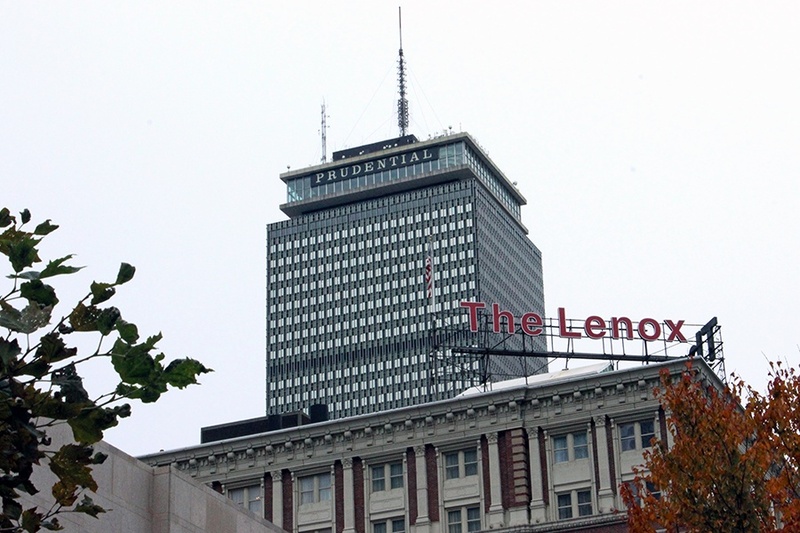 When the Pru pierced Boston’s short skyline in 1964, it towered over everything. Today, most Bostonians can’t picture the city without it—postcards, t-shirts, and Instagrams aren’t complete without a likeness of the International-style construction. The Hub’s favorite skyscraper, which is crowned by the Top of the Hub restaurant, soars 749 feet high, and is the second-tallest building within city limits (for now, at least). 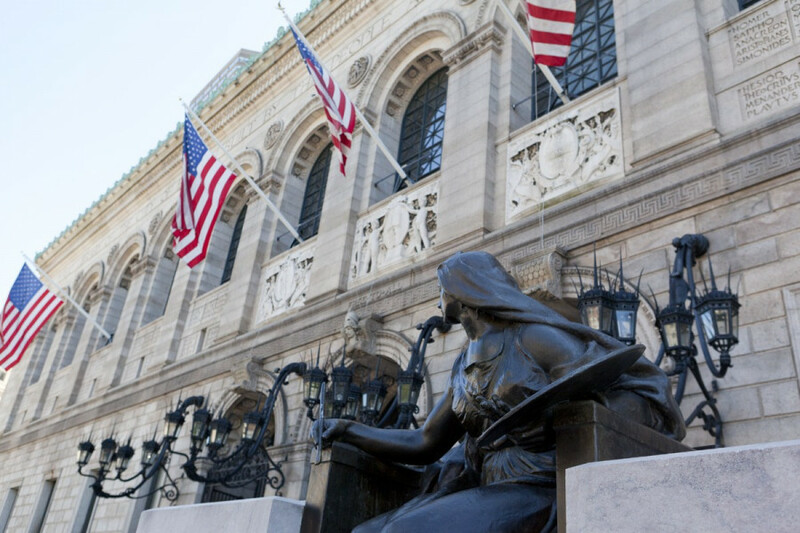 The BPL is a combination of two stunning structures: the Beaux Arts McKim Building and Brutalist Johnson Building. 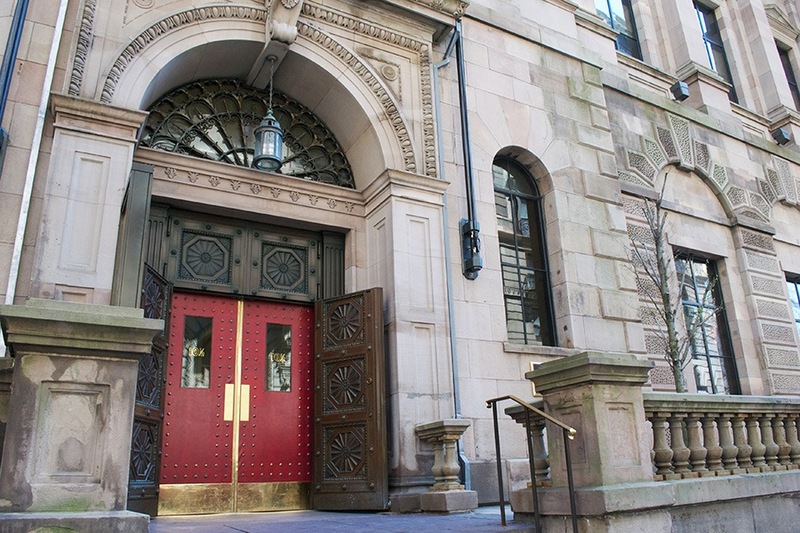 The McKim has always had impressive curb appeal, from its iron scones to its arching bronze doors. The Johnson, added by architect Philip Johnson in 1972, wasn’t always so fortunate. But in 2016, William Rawn Associates finished an overhaul to the addition, opening it up to the street and letting abundant light stream into the country’s first public library. For Boston’s first skyscraper, you’d think the city would have scraped enough money together for a functional clock. 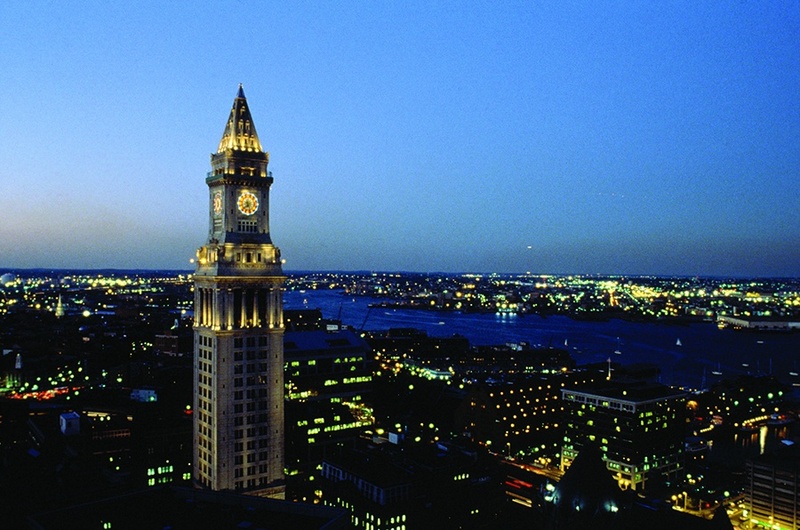 This Neoclassical tower, smack dab in the middle of Boston, had a faulty clock for most of the 20th century due to a motor that was too small to power its copper-plated California redwood hands. 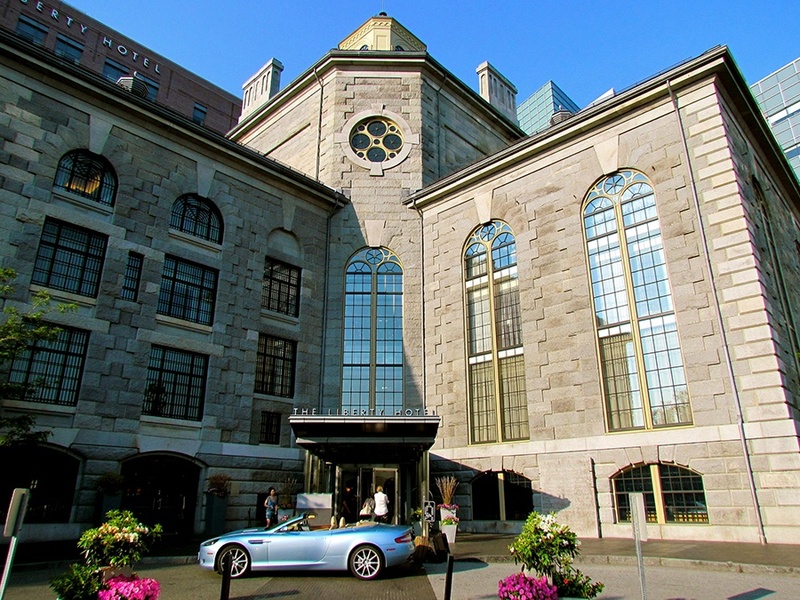 The former customs house is now a Marriott timeshare hotel, yet it’s still decked out with Quincy granite columns and a dome carved from Vermont white marble. The Erich Lindemann Mental Health Center is a hulking, overlooked mass of concrete that’s part of an incomplete building complex. It’s also a stunning achievement of one of the 20th century’s most renowned Modernist architects. 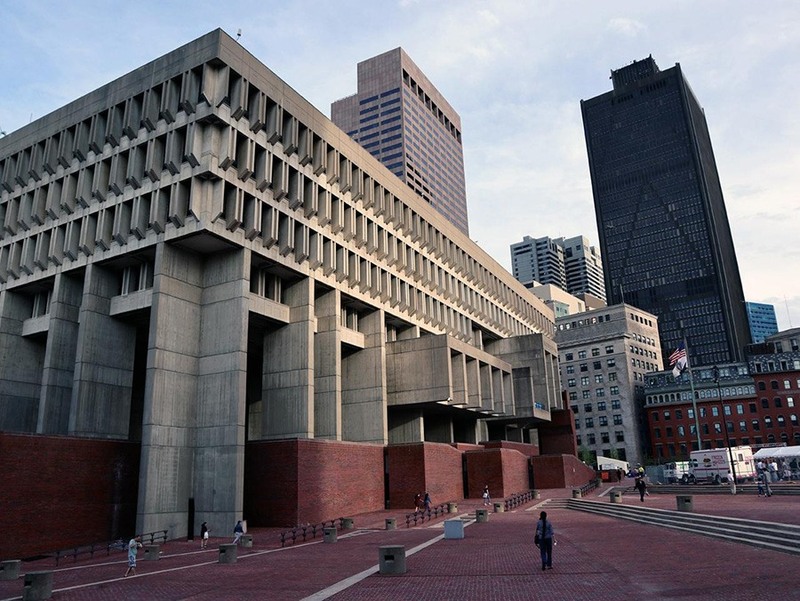 Designed by Paul Rudolph in 1962 and completed in 1971, the Brutalist creation is a decidedly imposing presence just a few blocks from City Hall. Dramatic concrete projections heighten its grandeur, while dark shadows are cast by sunshades. Perhaps its most distinctive feature is its rippling walls, which workers finished by hand, first casting the concrete in ribbed wooden molds before using bush hammers to chip away at the aggregate. A balance of form and function, the texture masks large swaths of the exterior from the discoloration that comes from weathering. It’s true that there are two structures in the city referred to as the Berkeley Building, but this one, (as opposed to what’s known as the Old John Hancock Building) is the original. The six-story building is one of the most extraordinary examples of Beaux Arts architecture in Boston. 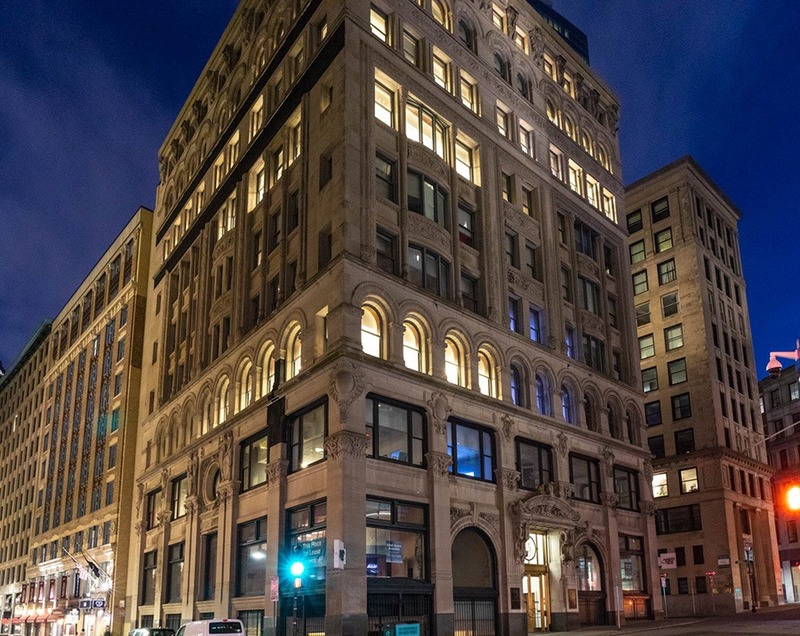 It’s also one of the most notable commercial buildings of the early 20th century, according to the Boston Landmarks Commission. That’s thanks in part to its defining feature: a terra cotta exterior. The material has been preserved over the years, and the facade’s sea motif is still intact. On your next walk by, take a second to appreciate the ornate grill work that tops the building, then look for the fish, seaweed, and sea shell sculptures adorning the exterior. The outside of 177 Huntington Ave. is straight out of 1972 (in a good way) thanks to its Brutalist grid design that refuses to be overlooked. 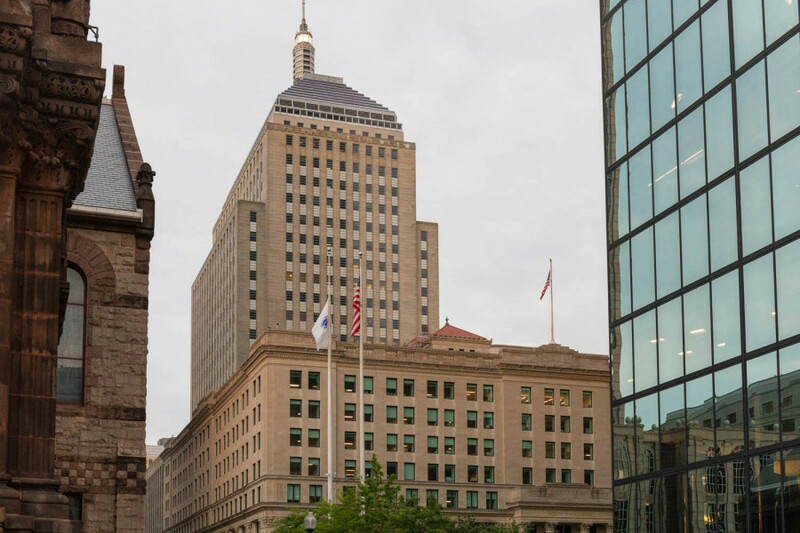 But its recently reimagined interior, with a “media wall” projecting light patterns from the soon-to-be-finished reflecting pool outside, makes the former Christian Science Center Administration Building feel new again. In its early days, the Hancock Tower (now known as 200 Clarendon) faced quite a few challenges. Most notably, during construction, windows broke and crashed to the street on windy days. But that’s all in the past for the iconic tower, which gleams and glimmers in all shades of blue and grey against a historic brick backdrop. 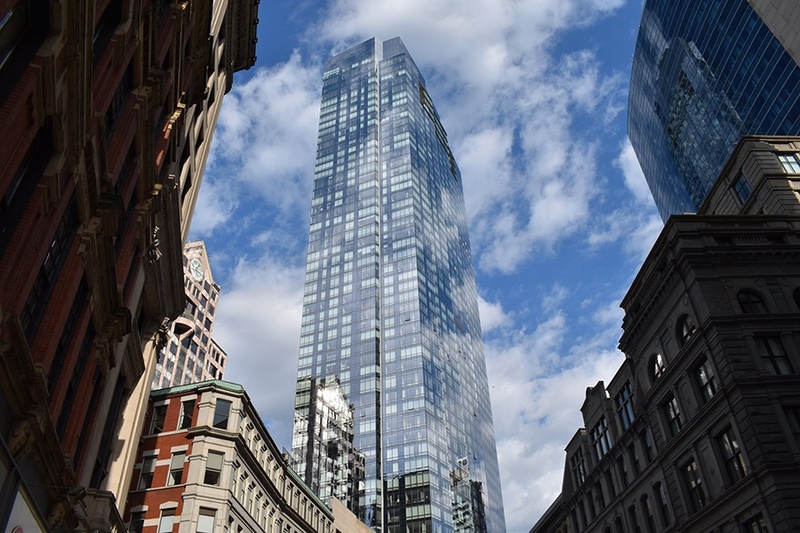 As the tallest building in New England, the 790-foot-fall Hancock is also one of its most beautiful, thanks to its all-glass exterior envelope. It was designed by renowned architect Harry Cobb, who also designed the tower that will soon take the tallest title: One Dalton. Prior to construction of the John F. Kennedy Federal Building, it was rare for the federal government to fully embrace modern architecture. And that’s what makes the JFK building so remarkable. Designed by Walter Gropius, the German founder of the Bauhaus school, the building is a true modern marvel. He worked under the firm The Architects Collaborative (TAC) along with his assistant, Samuel Glaser, to craft two 26-story towers, anchored by a much lower four-story building. Gropius’ Bauhaus ideals, which laid the basis for modern and International design, can be easily glimpsed in the JFK building. 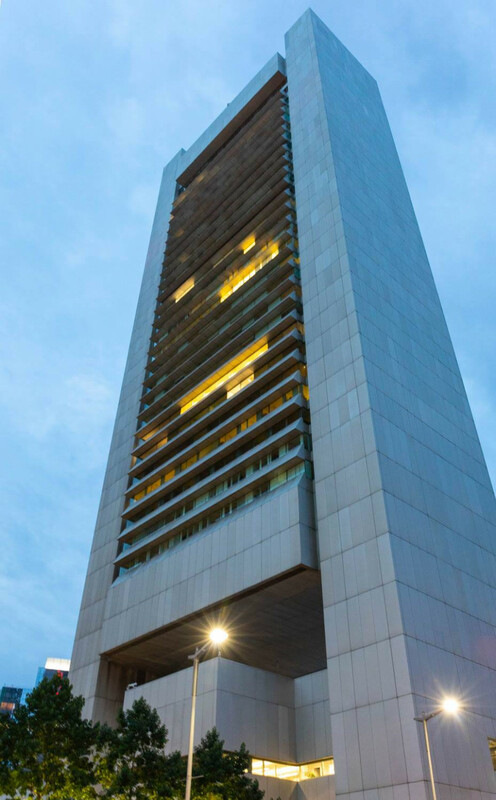 Its steel, glass, and concrete towers are sleek, refined, and minimally ornamented. The staggered towers make a statement of simplified design, rather than taking cues from their surroundings. Ah, City Hall. If it’s possible to be the most-hated and most-loved building in Boston at the same time, then this one takes the prize. Though it’s been ranked one of the ugliest structures in the world, City Hall is, in fact, not ugly. It’s brutal and it’s beautiful. 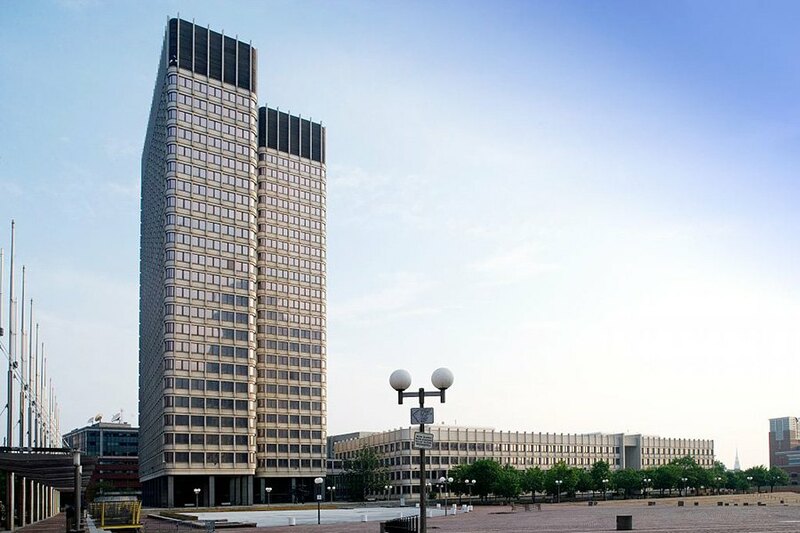 A reigning example of Brutalist architecture, Boston’s concrete-covered nerve center was the winning model of a 1962 design competition, and was built after Scollay Square was razed to make way for Government Center. The building was finished in 1968, and has been delighting (and horrifying) passersby with its honeycomb-like facade ever since. 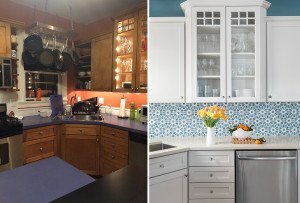 The Boston Home team has curated a list of the best home design and home remodeling professionals in Boston, including architecture firms, home builders and contractors, building supplies, custom woodworking, and more. Get the help you need with FindIt/Boston's guide to home renovation pros.